Congratulations on completing the previous Ten Lessons. I do hope you have learned a lot about Tarot throughout and are becoming familiar with all the Cards you have studied. We still have to tackle The Court Cards and The Major Arcana, but no doubt you haven’t been able to resist taking a look at Part II and Part III already. I don’t blame you for wanting to read as much as you can about this exciting subject. As this Lesson deals with taking you Step by Step through the Reading Process, it would be pointless if I were to put it as the very last Lesson in Part III, when all the Cards have been covered and Lesson Content too. That is because you do not have to wait to cover or study all the Cards intensely before you start Reading for yourself, or for others. By others, I mean family and friends. You should not be putting yourself out there as a Tarot Reader for the Public until the Whole Course has been covered and you are familiar with the process of Reading for others. However, this Guide also covers Reading for the Public and there is no harm in getting familiar with it all from the very beginning. 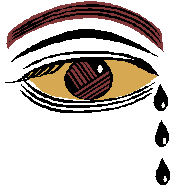 Therefore, depending on your Level of Reading, you will be approaching this Guide for information regarding Reading for Friends and Family as a Novice Tarot Reader, or if ready to become a Professional Reader you will want to carefully study all aspects of this Guide. 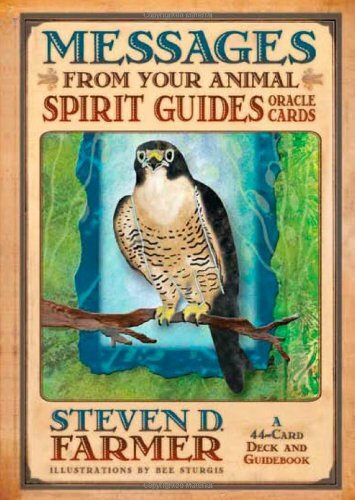 Please Note, that this is a Guide for Reading on a Professional Level but is not a Tarot Business Guide. The Business area of Tarot will be covered in Part III of this Course. At this Stage, you are well on your way, and I believe are ready to test your fledgling wings by Reading for people you are familiar with, people who won’t mind if you have to sit staring at the Cards for five minutes before saying anything. This Lesson is going to be all about The Reading Process and will Pull Together much that we have already covered, along with areas I have alluded to throughout the Course. Lesson Eleven will act as a Reference Guide to Reading, right from the very moment someone enquires about a Reading, to preparing for The Reading, dealing with your Client on arrival, the Pre-Reading Process, The Reading itself and finally the Post-Reading Process. Lesson Eleven also covers some of the Pitfalls you will encounter when you first start Reading, and will give you some Guidelines, Tips and Advice on to how to deal with them. In Part II and III, no doubt there will be more information, but even after covering those Modules, Lesson Eleven in Part I should be returned to again and again so that you develop a Reading Process and a Routine that you feel comfortable with. 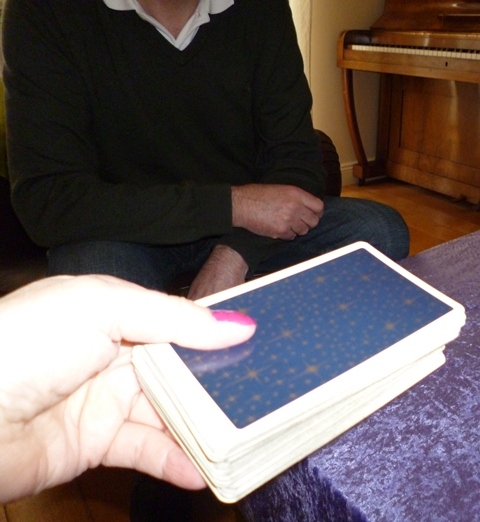 My aim is to make Professional Tarot Readers or Consultants out of all of you, and therefore it is essential you study this section of The Course, not just once but several times. Starting off with Good Reading Habits is essential, and I am very conscientious and nit-picky about the importance of being, feeling, acting and behaving Professionally even if you are just at the Aces stage of learning Tarot. Start off sloppy and careless in your Readings and you will continue to do so, maybe getting worse as you go along. In Part III I will be covering the Business Side of Tarot which, if you decide to become a Professional Reader, must be looked into. The Business side of Tarot will also cover how to Market yourself as a Professional Tarot Reader or Consultant, and how to build Clientèle, so it is very important. The more information you have at hand, the better you will be informed and the more confident you will feel about setting yourself up as a Professional Reader. In Part III I will also be covering the area of Teaching Tarot, or indeed Teaching Truly Teach Me Tarot to others if you feel ready and able to do so. How to become a Certified Truly Teach Me Tarot Teacher will also be covered in Part III of this Course. 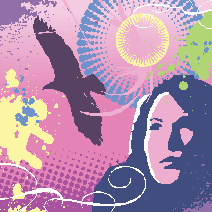 Yes, under certain Conditions and Guidelines, and with my Consent and Seal of Approval, those interested in pursuing a career Teaching a Truly Teach Me Tarot based Course will be able to use my material to do so. If you wish to become a Tarot Teacher, then I advise you to work hard on this Course and do let me know if that is your ultimate intention. 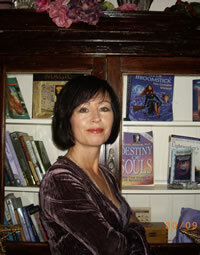 I will be supplying details on how to apply to become a Truly Teacher Me Tarot Tutor in Part III. There is a shortage of Good Tarot Teachers so if that is the way you wish to go, then work hard. I have attached a Contact Form to this Lesson if you are interested in becoming a Truly Teach Me Tarot Teacher in the future. You will find this Contact Form at the End of The Page. So back to the Business of Lesson Eleven. 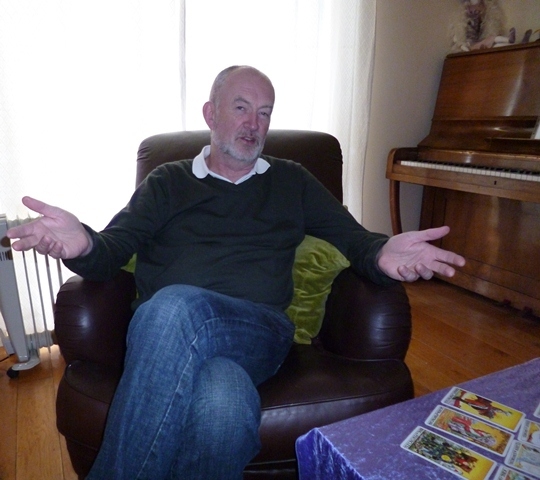 Below we will be looking at the various Stages of doing a Tarot Card Reading for others. I have covered as many areas as I can but this Lesson may be added to as more ideas come to light. You may think this is a lot of information but really when it is broken down, you will see that it is just a process, and one that you will adapt to quite easily, if that is what you wish. Some of you will already have your own way of doing things and that is fine. However, you may pick up some other tips or methods from the information supplied below. I will be recording a Video to accompany this Lesson in the near future. 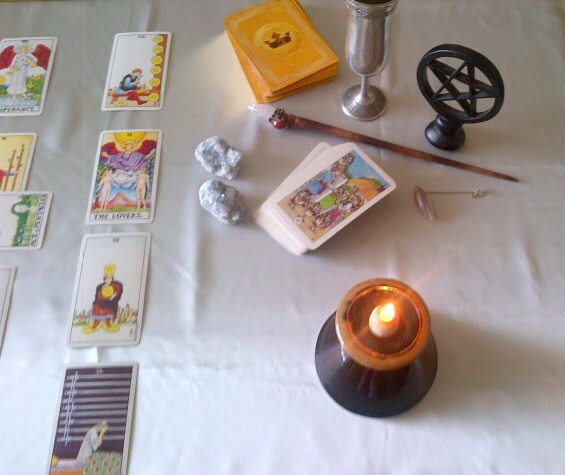 I have found with Students in the past that even though they have enthusiastically and doggedly studied The Tarot, they feel insecure about the Reading Process and are nervous and unsure of Reading for others. The same applies when it comes to becoming a Reiki Healer. It is not that the Students are incapable of doing a Healing, it is the Process and Dealing with the Public that unnerves them, even if it is a friend or family member. Therefore this Step by Step Guide should be of assistance to you when first starting off. I provide a Step by Step Guide for Reiki Healing too in my Reiki Manual which I will be making available at a later stage. Tarot first and then the rest will follow. 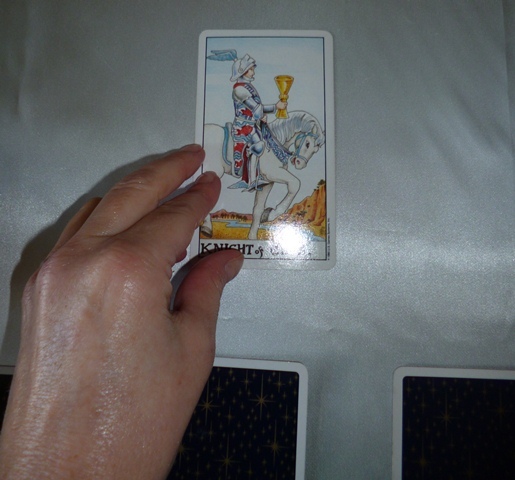 The First thing to remember is that you, the Tarot Reader/Consultant is the person in control. You are in charge. Therefore you lead and The Querant follows. Buy yourself, an Appointments Book or Diary. You can use your Smartphone if you like, but it is best to have a hard copy of any Appointments you make. Your phone may get stolen, lost or the battery run down. Use your phone to set reminders of Appointments that are scheduled. 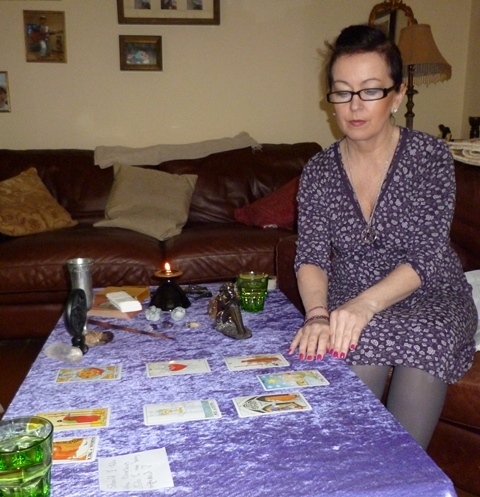 Before you book anyone in for a Tarot Reading, it is essential that you establish what type of Reader you are. Most people do not know the difference between Fortune-Tellers, Tarot Readers, Psychics, Mediums and Astrologists. They tend to lump them all together and feel that they should be expert in each area. 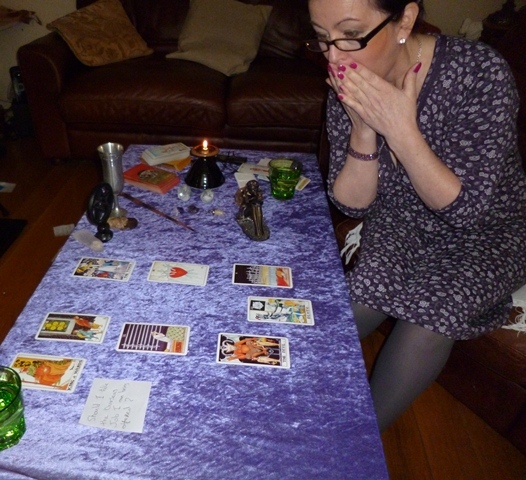 Most people are familiar with the old-fashioned idea of Tarot Reading where they take off their wedding or engagement ring beforehand and sit tight-lipped throughout the session wanting to see what the Reader can pick up about them. They are impressed if the Reader tells them that they are married or have a certain number of kids. Even better if they mention a deceased mother or father, or that they are very strong-minded or creative. Better still is that they will travel over water in the coming months or that romance is only around the corner. This type of trivial detail keeps them happy and is all they are looking for. This type of Querant will not expect to have any input except the occasional nod or shake of the head. They will sit riveted to their seat with huge staring eyes as they feel they are in the presence of one who can see all kind of spirit energy around them. When you receive an enquiry, find out where they got your name from? Were you recommended or did they find your number on a flyer you had posted. This is good for building an understanding of where your clients are coming from and how effective your advertising is. Ask them if they have ever had a Tarot Reading before? If yes, enquire as to how long ago it was and what type of Tarot Reading it was? This will give you an idea as to the type of Tarot Reading they are used to and their understanding of how Tarot works. Also ask them how useful it was and if they derived any benefits from it? With that done you now need to find out if you are the kind of Reader they are looking for. 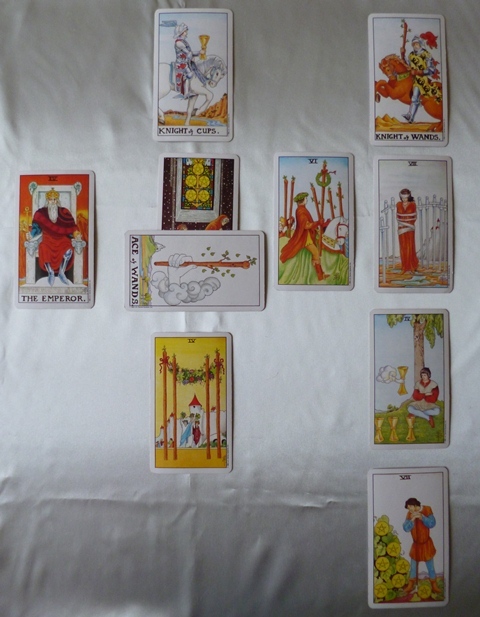 Explain the nature of your style of Tarot Reading or Consultancy. Let them know that you will be asking some questions throughout the Reading or that you will be expecting input from them. Tell them that it is possible to get so much more out of a Reading when both The Reader and Querant work together. Reassure them that it is okay should they wish to ask questions during the Reading. If you don’t do Health, Finance, Legal Readings tell them so in advance. There may be other areas you do not feel comfortable with so you need to set your parameters and the enquirer straight in these areas. If you are not a Psychic or Medium then also inform them of this. I have discovered this over the years with clients turning up looking for contact with a deceased loved one, thinking that I would be able to combine Mediumship with Tarot Reading. I am a Tarot Consultant and not a Medium. They are two very different areas of spiritual discipline. Some Readers are both. It is possible to do a Reading for a Querant with the intention that the Reading contains messages from a certain deceased person. However, people turning up usually are looking for the traditional Medium Style Reading. 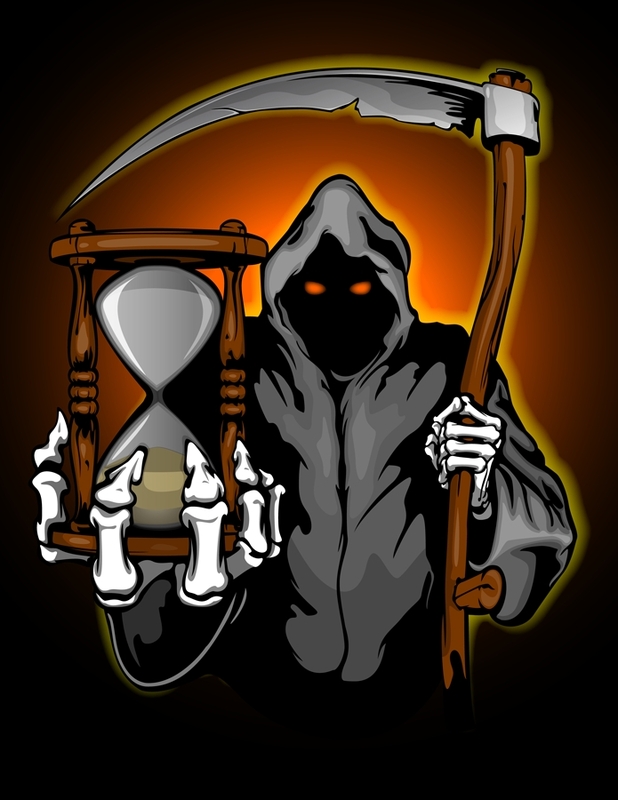 Tell them how long the session will last and how many Readings they can expect in that time. Tell them your fee and preferred method of payment. It is useful to ask them to bring the exact amount as you may not have the correct change to give them. Often I have had to take less money from a client because I had insufficient change for a larger note they had. Give them detailed directions to where you are and let them know that you have a client coming in after them. I have been left many a time with clients turning up an hour late for appointments with excuses that they had got lost or left late. If they know they may miss their slot they will be sure to leave on time and to follow your directions. It is extremely useful if you have a Tarot Client Information Brochure that can be forwarded by email to prospective clients. Your Brochure should contain some background information about Tarot, the kind of Reader you are, the Process of your Tarot Readings, How long it will take, what the Client should expect and the Fee you charge for your Services. It should contain your Tarot Readers Code of Ethics, Disclaimer and any areas you do not Read in, such as Health, Legal Matters or Children. It should also contain Contact Details, Web Address and Directions on how to find you. 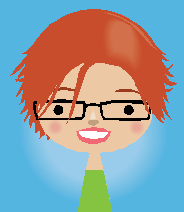 It is very important that your Brochure include a small picture and bio of yourself. If your Client would prefer the Brochure by post make sure to add p&p onto the cost of your Reading. Indeed, the preparation, paper and cartridge ink are part of your overheads so it is a good idea to factor these costs into your Professional Fees from the very start. 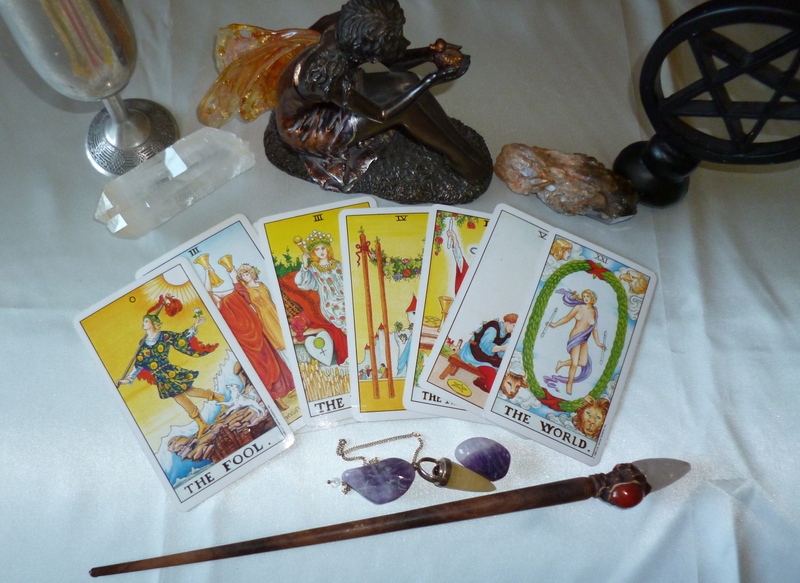 We will be taking a closer look at setting your Tarot Card Reading Fee further on. 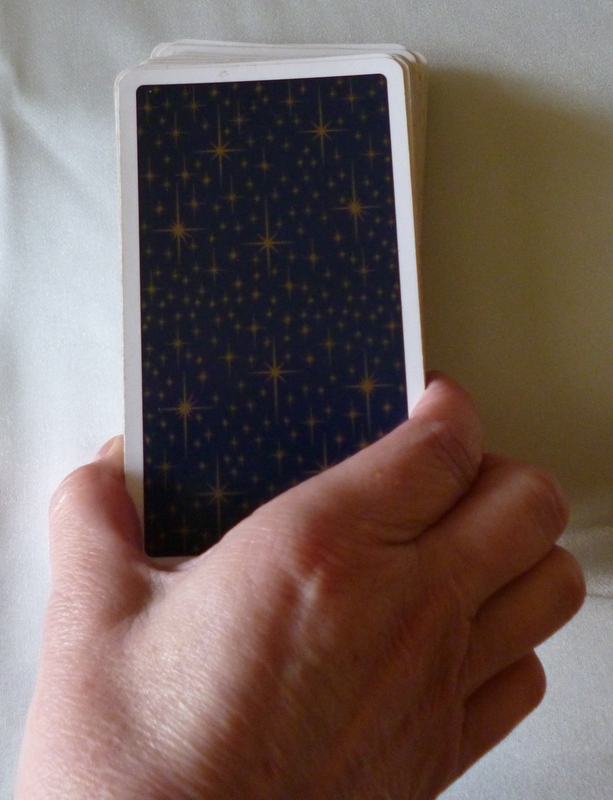 In Lesson Ten I provided information on Tarot Brochures but here is the link again. Just Click Here – Sample Brochure. 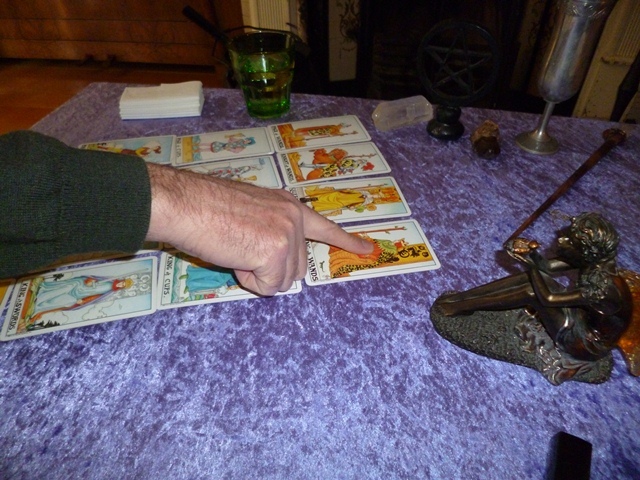 Properly informing your prospective clients in advance as to the nature of Tarot Reading and the style of Reader you are, eliminates any misunderstandings on the day of their appointment. Let me put it this way. Both Querant and Tarot Reader are now singing from the same hymn sheet. The Client/Querant is happy with what you have told them and believes that you are the right person for the job. Therefore they have booked you and are under no illusions as to what they might expect from you or their Reading. If you have informed them that you are not a Medium then they won’t be expecting any messages from the other side. Everyone is happy and gets what they want. If they are happy to make a booking, ask them to meditate on their Question or Issue in the meantime as this helps for a much Clearer Reading. Ask them to try as much as possible to detach themselves from the Outcome, to be open to what The Cards may have to tell them and to let go any rigid mindsets they may have around their issue. With all that done, you can relax in the knowledge that the person coming to you is not expecting anything from you that you cannot deliver on. They have made the booking on that basis. The above information is very important. I have had phone calls in the past asking me if I am the Tarit Teller, The Fortune Tarot Woman, The Psychic Tarot Woman etc. I always sigh deeply when the first question asked on the phone is ‘well are ye any good then? I will only come to you if you are good’. ‘Good at what I ask?’. ‘You know seeing things and speaking to dead people ‘or ‘what are you picking up from me on the phone?’ I tell them that they have the wrong person and really need to see a Psychic or Medium instead. I then politely end the conversation. Could you imagine if I just took their booking and let them turn up? Also, when I get a call from someone wanting to book a ‘few of us in just for a bit of a laugh’ my blood runs cold. These are the very times when you see terrible things in their Readings and because you know they are only there for a laugh, it is impossible to tell them anything other than minor detail. Having a Personalised Brochure to send out takes all the hard work out of it. NB. The entire above can be discussed and taken care of on the phone in a matter of a couple of minutes. It may take longer if the enquirer has never had a Tarot Reading done before as they may be nervous and unsure about getting ‘bad news’. 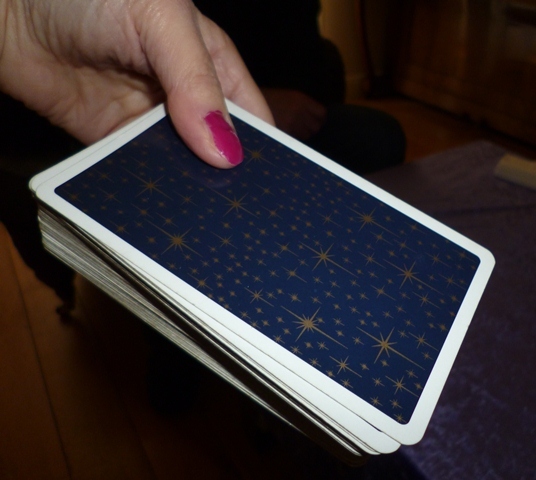 In these cases you will have to explain a little bit about Tarot to them and that there are no real ‘badCards’. 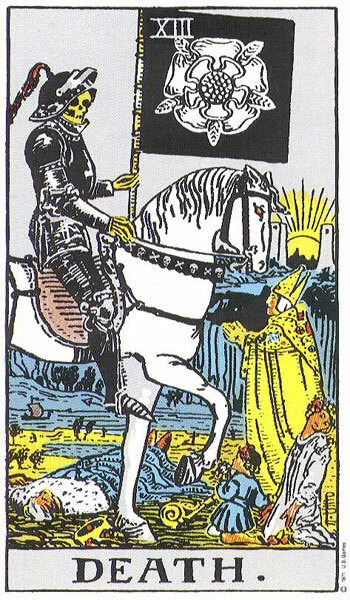 Everyone is familiar with The Death Card in Tarot so you can use that as an example to tell them the true nature of that particular Card and how it should be viewed as liberation, transformation and clearing of unwanted baggage, and that it is not necessarily negative. However, all said and done, do not be drawn into long and lengthy discussions about Tarot on the phone. Some people will take up your whole day if you let them. A simple explanation of Tarot is to say that it is very similar to Dream Interpretation as the information comes from their subconscious through the Cards they have shuffled and selected. You as The Reader understand the meaning of the Cards and then interpret them so that their message is communicated to them in a language they can understand. There is no Hocus Pocus involved nor are the Cards controlled by spirits or demons. With all that taken care of you must prepare yourself, your Space and Cards for The Reading. There is no need to do anything until the day or evening before the appointed Reading. 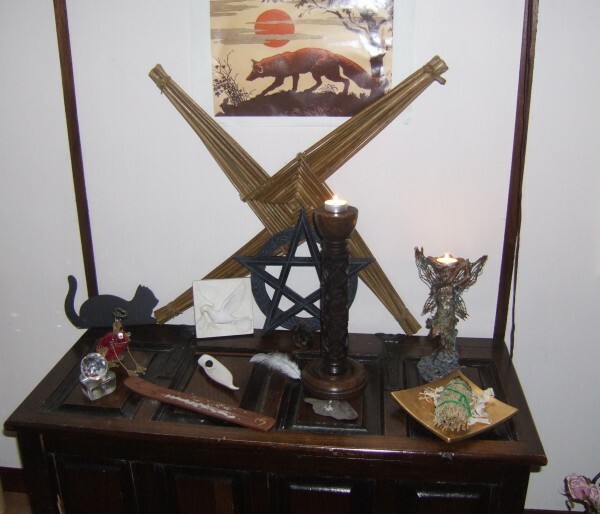 Some Pictures of My old Healing and Reading Room. It will be getting a make-over this year so will bring you the new photos when work has been completed. Pictures are to give you an example of why you should make an effort to make your Reading Space Welcoming and Inviting. 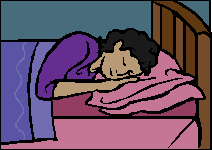 If possible, set up your Reading Space the evening before the Reading. Of course that is if you have an area that has been designated especially for your Readings. Many Readers make do with their kitchen or living room table and so may not be able to prepare them until shortly before the arrival of their Client/Querant. Regardless of designated space or the communal kitchen table, it is always a nice touch to go to some trouble to make it look atmospheric or suitable for a Tarot Reading. Therefore clear away anything that looks out of place. This also applies if you are using hired facilities. 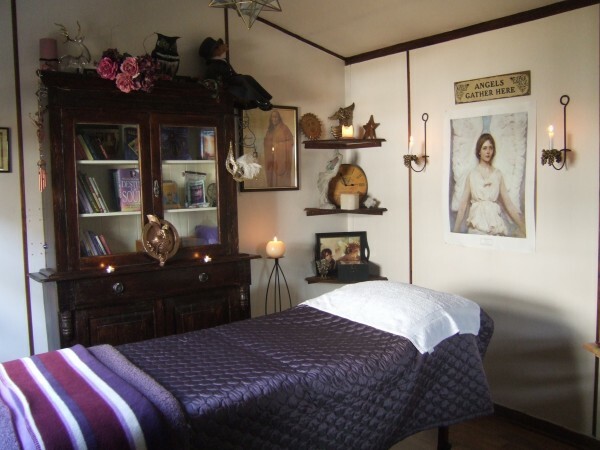 Generally they will have the basics available unless their premises are dedicated to holistic and spiritual therapies. Always bring your own few bits and pieces to personalise your Reading area. Remember you want to look Professional from day one. Table Set for Reading. 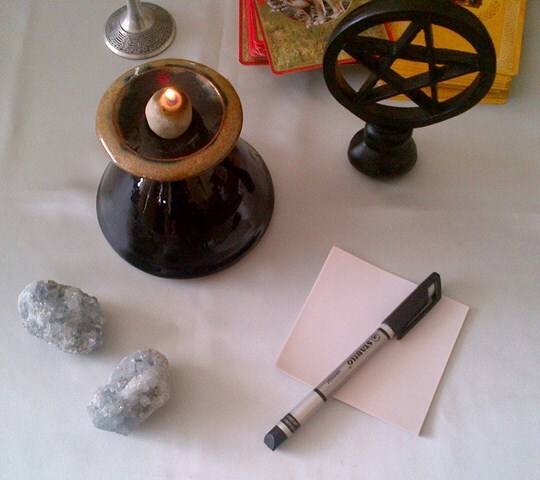 Silver Satin Table Cloth, Chalice, Pentacle, Small Sword, Wand, Pendulum, Paper and Pen for Numerology, Oil Burning Lamp, Crystals, Selection of Non-Tarot Cards, Pitcher of water, Two Glasses, Tissues beside Client Seat, Comfortable Seat for Client, Extra Radiator in the background in case Client gets Cold. NB. It goes without saying that the room should be clean and free from stale odours. It is important to remember that your Querant may need to use the bathroom during their visit with you. Make sure that room is clean too and that you have fresh towels available. The route to the bathroom should be free of clutter and dirt otherwise it leaves a bad impression. Remember, Professionalism, Professionalism, Professionalism. If you are just hiring a room in a centre for your Readings, you can only do a certain amount but there should always be a clean Restroom with warm water, soap and fresh towels, even if you have to bring them yourself. I can’t tell you the amount of times I have been for therapies where I felt like wiping my feet leaving the premises instead of wiping them on the way in! A nice velvet, silk or satin cloth on the table is very appropriate. Make sure it is not covered in pattern as then the imagery on the Cards has to compete with other non-relevant detail which can be very distracting. 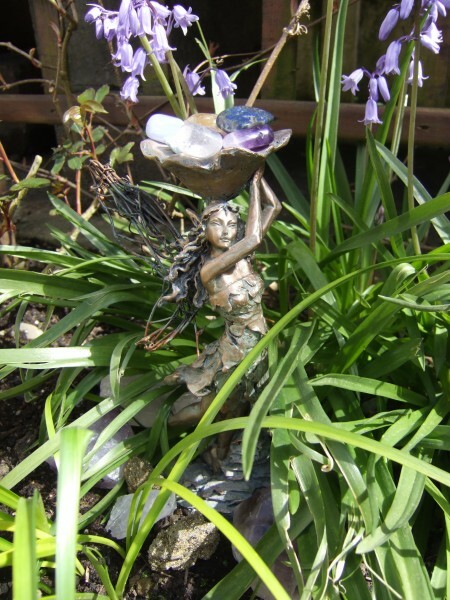 Now you can add some items that hold special meaning for you or that help you focus, such as Crystals,Feathers or Bells. I typically have a small Upright Pentacle, a Wooden Wand with a Rose Quartz Point, a small Chalice/Cup and a miniature decorative Sword. These I use to represent the Four Suits. Candles are always a welcome addition but be careful about burning incense as some people are allergic to it and it can be harmful to pregnant women. 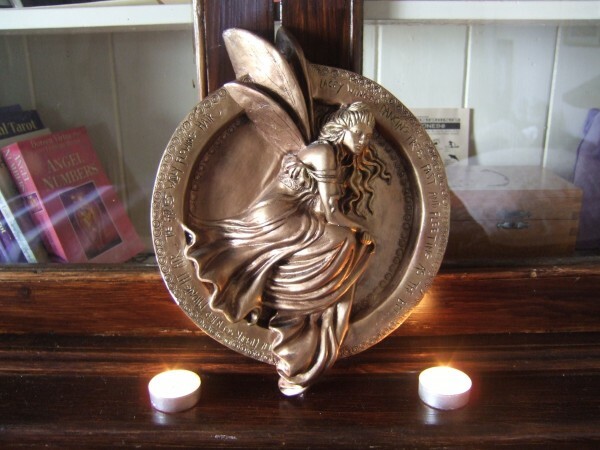 I also have a few other Decks of Non-Tarot Cards on the table such as Angel Cards, Goddess Cards and Fairy Cards. If time allows at the end of a Reading I often let the Querant pull a couple of these. 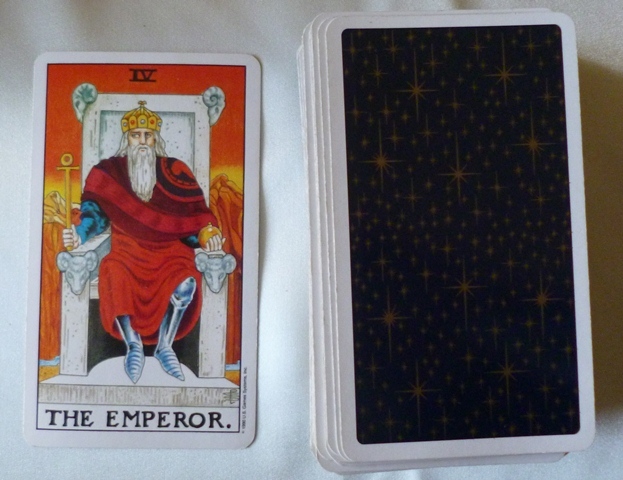 I do not go into the interpretation of these Cards as usually they have a written message on them. They are for the Querant to decipher. Believe it or not, they generally mirror what their Tarot Reading was about or offer comforting words. They can be a nice way to finish off a Reading and act as a signal to the Querant that the Tarot Reading is now over and the session is drawing to a close. A method to notify you that a Reading is nearing its closing time is to use your mobile/cell phone. Set it to Silent during the Reading of course but set a Notification Alarm for approximately ten minutes before the end of the Reading. Most mobile/cell phones have a variety of Spiritual Themed Tones or Rings that will blend in perfectly for the occasion. Don’t forget to ask your Client to set their phone to silent during their Reading, that is unless they need to be contactable at all times. 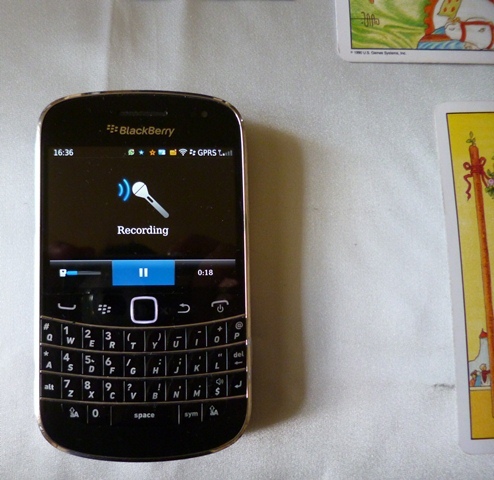 Many Readers now offer their Clients the option of purchasing a Recording of their Reading, or include it in the fee as it is often difficult to remember all they have been told once they leave the room. If you would like to do this, wait until you are quite comfortable with your Readings and able to communicate your interpretations without too much delay, stops and starts. Hesitant Readings may not be noticed by either you or the Querant on the day, but once the Recording of it is played back it may sound more like you were struggling with the Reading. It can also be quite rattling to know that you are being recorded, and seeing that little flashing red light acknowledging that it is picking up every word and every sigh can be quite unsettling. You need to get used to it before introducing it into your Tarot Reading Practice. It is a good idea to practice doing Recorded Readings with a friend first who will understand your nervousness. 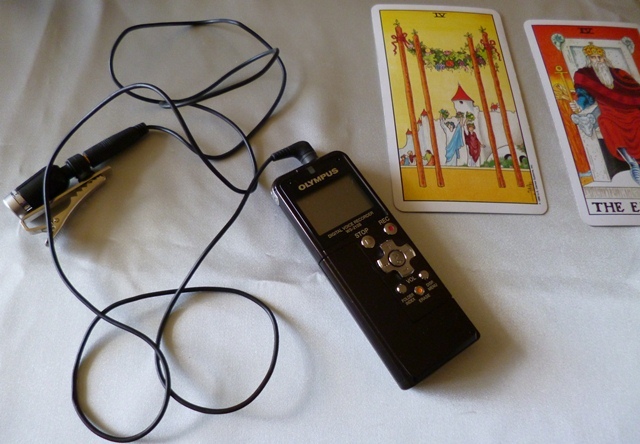 When offering a Recorded Session of a Client’s Reading, there is no need to start the Recording until just before the Cards are turned over and the actual Reading begins. Turn it off once the Reading is over. You just want The Reading on The Recording and not all the general chit chat that goes on. However any vital details that need to be discussed after a Reading should also be Recorded. Once you decide to offer Recordings of Client Sessions, you must ensure that you have suitable Recording Equipment, like a digital recorder or something similar. Remember that any Recordings have to be transferred onto a disc or stick to give to the Querant. The cost of all this will have to be included in the overall price of the Reading or if you are offering it only as an Option you can set an additional fee for this service. Most Clients will be happy to pay the extra for a Recording but you will have to be prepared to pay for all the equipment upfront and then wait for it to come back to you bit by bit. In a short time it will have paid for itself and you will begin to make a profit. However, there will always be on-going costs to cover such as discs or sticks. Also, you may decide to post the Recording at a later date and then you will have to factor in post and packaging to the additional charge. Make sure you take all this into account and not end up like many eager Readers do when they first start out, offering everything for little or nothing and then discovering down the road that they are practically working for nothing. We will be covering the practical and sometimes boring Business end of being a Tarot Reader or Consultant at a later stage. 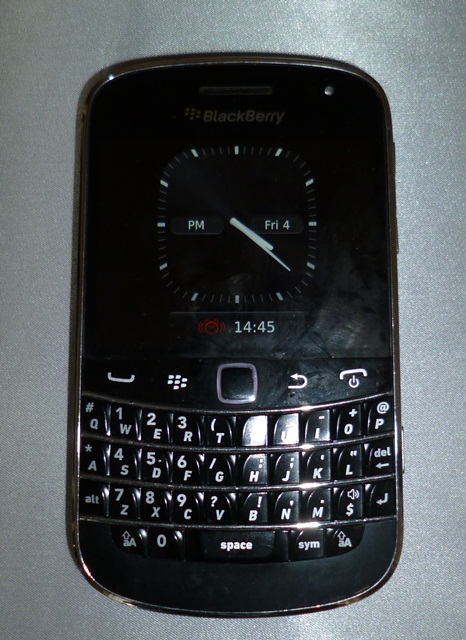 Better still is if your Querant has a mobile/cell phone that is suitable for Recording. They can then record their own Reading and it removes the onus from you to sort it all out. It goes without saying that you do not charge your Client if they are using their own Phone to Record. You can do a quick Recording Check to make sure it works before proceeding with the Reading. If they don’t have a suitable phone and you do, then use yours and send them the file later by email. You can add an additional charge to the Reading for this. Make sure you have a pitcher or bottle of water on the table and two glasses. Talking for an hour and a half can be thirsty work, especially if you are doing a couple of Readings in a row. Very important is to have plenty of tissues as tears arrive 90% of the time. Keep Lighting low but not so low that you cannot see the Cards, but a strong overhead light is not relaxing and certainly not conducive to creating the right atmosphere. Very importantly too is to make sure that the room is warm but not stuffy. You may not feel the cold, but your Querant might and they will not get much out of their Reading if they have to sit shivering through it. Always have a few clean throws available should the Querant feel chilly. Ask them throughout the Reading if they are comfortable and warm enough? Ensure seating is comfortable and that there is good support in the chair. The Querant will have to sit for an hour or more and will want to see the Cards. They cannot do this if they are too low or keep falling back in the seat. If you are playing some background music, may sure it is low enough so as not to disturb the Reading. You don’t want to have to shout over it. Ask the Querant on arrival if they prefer the music on or off as they may find it distracting. With the clean room and table dressed, it is now time to do your Psychic Protection, Cleansing and Grounding of Self and Protection and Cleansing of Reading Space. (Some Readers do this before setting up, so do what you are comfortable with) Last but not least your Tarot Cards and any other Cards you choose to use should also be Cleansed. 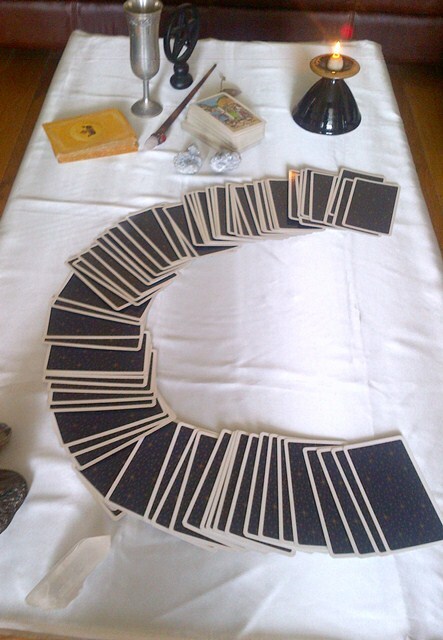 All your Cards should be dealt out into three piles as you Cleanse, Upright any Reversed Cards so that you are dealing with a Clear Deck for each Reading. Give the Cards a Shuffle suffusing them with White Light and setting the intention that these Cards will now be used for the Reading of —— (name the person). After you Shuffle, take a look at the Base and Top Card. Take a mental note of these Cards as they are very often relevant to the upcoming Reading. Note- If you are Reading at a Holistic Fair or a Tarot Party, you will not have much time. Just make sure you Upright all the Cards as quickly as possible between each Reading and give them a good Shuffle while doing a quickie combined Cleansing and Protection of Self and Cards. *All said and done, you do not need any of the above props to do a Tarot Reading. 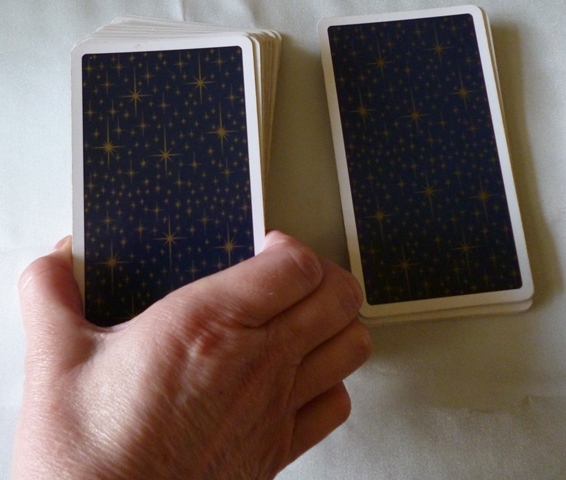 Many Readers carry their Cards around with them all the time and just pull them out when required. This could be at work, in a friend’s house or even on the bus. The most important thing is that Cards are Cleansed, Upright to start off with and that you do a quick Protection and Cleansing of Self before Reading for anyone. Stage Four – Arrival of Client and the Awkward Money Bit. Make sure you are ready and prepared for the arrival of your Client, even if it is a friend or family member. Project a Professional Image from day one. 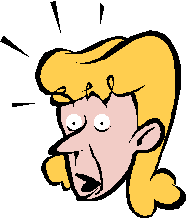 If you are unprepared there is a tendency to get flustered. Remember, Prior Preparation Prevents Poor Performance. If possible refrain from asking for payment before the Reading or the moment after the Querant walks in the door. This will be a personal choice but for me I always am put off by this approach. When my son was terminally ill, I went to see a hypnotherapist with a view to him hypnotising my son to send sublime messages so that his tumour would shrink. I had heard it worked for others and was desperate to try everything. The hypnotherapist was informed that my 11 year old son had only months, if not weeks to live. He accepted the booking. 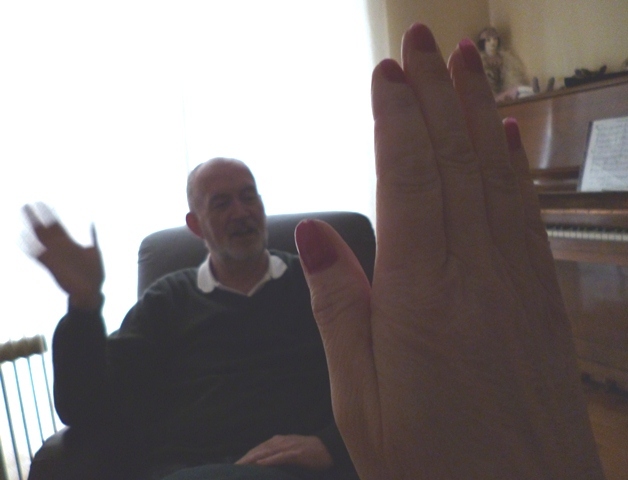 When we arrived on the day of the appointment, he saw that I had to help my son up the stairs and into the therapy room. Before anything else happened, he asked me for payment up front. He told me his fee was €250, a very large sum of money. At that stage, money meant nothing to me but I felt uncomfortable with his approach especially as he was dealing with a dying child. He told me to stay outside the room and that the session may last for an hour or more. He was back out in 15mins explaining that he could not get my son into hypnosis. He apologised and said that sometimes it happens. He hurried us out the door and there was no mention of a refund or even part refund. I was too embarrassed and not assertive enough to ask. He had taken money from a desperate woman and her dying child and had offered us nothing in return. It took me ages to get my child back to the car while the Hypnotherapist laughed all the way to the bank with my €250. I must say it left a very bitter taste in my mouth and mistrust in my heart. I myself do not ask for money until after the session, and yes, there have been a couple of times when I have been badly stung. One girl suddenly realised she had forgotten her wallet and vowed to come back the next day. She never arrived and refused to answer any of my phone calls. Another person who I used to give free healings to when she was out of work pulled the same stunt after attending a workshop. She too promised to come back with the money but never did. I heard nothing from her until recently when she asked to be a friend on Facebook!!!!! Getting paid in advance for workshops is very different to getting paid in advance for a Reading. For workshops, one generally pays a deposit and then the balance on the day. Because I had known this person for so long, it never crossed my mind that she would take all my tuition, my time and the certificate with the full intention of not paying for it. People ask me should I not know that this will happen with certain people but I generally am trusting and give a lot of lee-way with clients. It is up to you whether you ask for payment in advance or not and sometimes this comes down to where you live. In certain countries everyone expects to be asked to pay in advance while in others, like Ireland, people expect to pay after the work has been done. We pay our hairdressers on the way out the door and not on the way in. The doctor gets paid after our consultation and not before. Check out how others are doing it in your area or country and if it suits you, go with the flow. Greeting The Client in a Positive and Friendly Manner. Make sure to Introduce Yourself. It is important to remember their name. 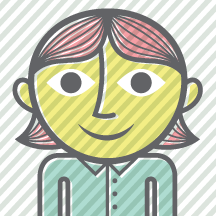 Greet The Querant warmly and introduce yourself to them. Make them feel at ease. If you have not already done so on the phone, enquire as to whether The Querant has ever had their Cards read before? If not, explain briefly to them how the Cards work, what to expect and not expect as you give them an idea of what type of Reader you are. Reassure them that they have no need to worry should any apparently negative Cards come up as all Cards give constructive advice. Have a little chat. Ask The Querant what it is they seek from The Tarot, what it is that made them book an appointment with you? Tell them that to get the most out of the Reading, you would like to hear a little of the nature of their issue. Be very clear with them that all you seek is basic background information and after that you will ask questions as the Reading proceeds. 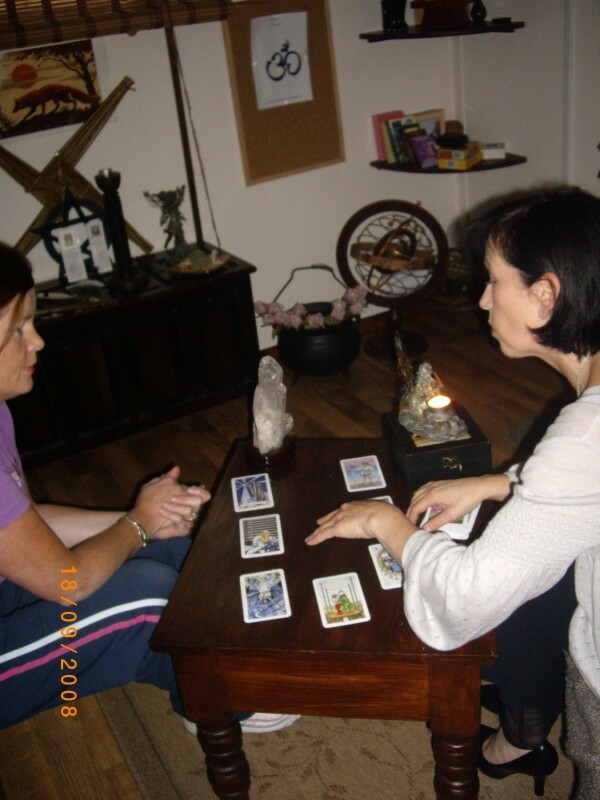 Some Querants might be dubious about giving you any information as they might believe that you should be able to see it all in the Cards, or that you are Psychic (very few Tarot Readers would actually class themselves as Real Psychics, but from time to time will have a surge of Psychic Flow during a Reading. However, they will not be able to turn this on at will as it just happens out of the blue). Other Querants want to bleat their little hearts out to you with the ins and outs of their whole issue. If so, stop them in their tracks. There is nothing more annoying than seeing it all in their Cards, telling it back to them and then wondering if they think you saw it at all or were just remembering what they had told you. I usually tell them that all I want is the bare bones of their story, just enough to launch the Reading from. I explain that I do not expect them to sit there silent throughout the Reading, and will want their input and ask questions of them as I see fit throughout the Reading. I tell them though that if they give me too much information I cannot remain objective and their Reading will be Tainted. I may start jumping to my own conclusions instead of Reading their Cards or I could become biased in their favour. Then I lose control and I may deliberately search for the interpretations that will make my client happy. This explanation usually puts their mind at ease with regard to me being a fake or a charlatan. Ask your Client to let go of any attachments they have to the Outcome of their situation, to be open to what the Cards have to tell them and to let go of any rigid mind-sets they have about their issue or situation. Inform them that if they hold a strong emotional desire for a certain Outcome, their Cards may mirror this but may not be accurate, as they will have tainted their own Reading by forcing The Cards. After getting a brief background history of the issue, now is the time to let the Querant select their Significator. Not every Reader uses Significators as the selection process can eat into the time allocated for Reading. If the Querant is unfamiliar with Significators you must explain their nature to them. If you do have plenty of time, the Querant’s choice of Significator yields considerable information about their personality type, how they see themselves in this situation and from your study of The Court Cards, how they are most likely to react and behave. The Reader now establishes with The Querant whether this is to be a General or Specific Question Reading. 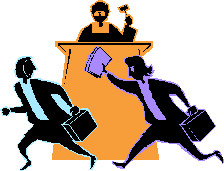 Even if The Querant has a Specific Question, a General Reading is often used to kick start the session. The General Reading will give a General Overview of the Querant’s life. If it is to be followed by a Specific Question Reading, The General Reading should be brief. If the Reading is to be solely General then more time is allocated to it. A General Reading usually throws light on an area The Querant would like to take a closer look at. They can then formulate a Question Reading from the Findings for their Second Reading. 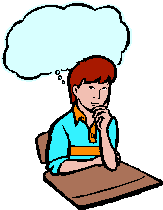 If it is a Question Reading, then The Reader helps the Querant word the Question to ensure a more accurate Reading. It is good idea to write the Question down on a piece of paper and place it at the top of the Spread of Cards so that it can be referred back to at any stage. This helps focus and keeps the Reading on track. It is up to you whether you decide on the Question before or after selecting The Significator. The Querant’s Question for his Reading. 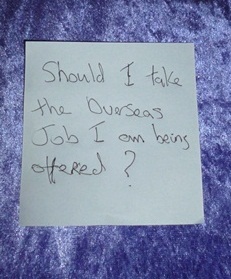 Should I take the Overseas Job I am being offered? It is important to keep referring back to the Question throughout The Reading so that you do not become side-tracked. The Reader decides before the Shuffling starts which method of Card Selection he/she will use and which Spread is most suitable. The Reader can inform the Querant of this if they like. The more information being relayed to the Querant’s subconscious, the better it understands what is expected of it. If The Reader is not Shuffling then he/she hands the Deck to The Querant and instructs The Querant on how to Shuffle, and to concentrate or not depending on whether it is a General or Question Reading (concentration on the Specific Question is needed during Shuffling if Reading is Question based, no particular focus is required if it is General). Handing the Cleared and fully Upright Deck to The Querant prior to Shuffling. Before The Querant starts Shuffling check to make sure all Cards are Upright. If there is sufficient time, ask The Querant to Deal out the Cards individually into three piles before Shuffling. You, the Reader will already have Cleared and Cleansed the Cards in this manner, but allowing the Querant to do the above forces them to touch each Card thereby infusing them with their personal energy. Some Querants need to be encouraged to give the Cards a good Shuffle so this is a good method to ensure they have transferred their energy and question to the Cards. Once all the Cards have been dealt out in this manner the three piles can be put back together again in any order so that Shuffling can begin. This should only take a minute. Skip this part if you are short of time. The Querant infusing the Cards with the Energy of The Question as he Breaks the Cards into three piles thereby touching each Card. The three piles are then put back together in any order prior to Shuffling. If Reading Reversed Cards, ask Querant to Reverse some Cards at random as they Shuffle. Do not encourage them to Reverse too many, as when this happens it is not uncommon for the majority of Cards drawn to end up Reversed. This makes for a very difficult and heavy Reading for both Reader and Querant. This part as simple as it actually is, is often confusing for the Querant as they often begin to turn Cards back to front instead of simply turning them Upside Down. 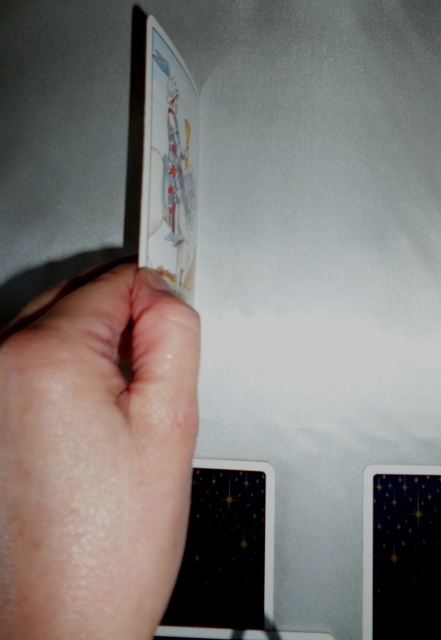 The Card/s selected for Reversing are Reversed 180º and not 360º as this will bring the Card back to its original orientation of being Upright. Watch Querant closely as they do this as you may need to guide them. It is not unusual when working with Reversed Cards for the Querant to end up Reversing some along with turning some back to front. If this happens, take the Deck back and begin again as you will find they have more than likely, in their confusion, Reversed half the Deck while the other half is turned face up. Remember it is not that the Querant is being silly, they are often anxious and nervous about the Reading ahead and are prone to make mistakes. Querant Selecting Card/s to Reverse. Starts turning the Card around 180º so that it ends up Upside down in The Deck and not Back to Front. Cards should never be face up in Deck as Querant is Shuffling. Advise Querant to select only a few Cards at a time to Reverse and not several. The Cards are generally quite large and the Querant is liable to drop some or the occasional one may Jump out, especially if they are nervous. Dropped groups or bunches of Cards from awkward or nervous Shuffling mean nothing and care should be taken to remove them from the floor in their correct Upright Orientation before placing them back in the Deck to be shuffled once more. Jumping Cards are a different story and can sometimes carry very important messages. Therefore they should be either be kept aside to be included in the Reading or taken note of before being placed back into the Deck. 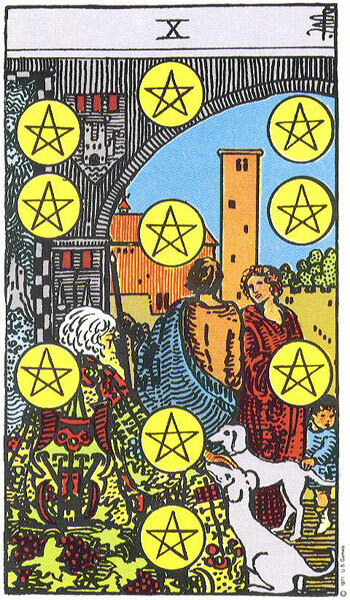 Should the Jumped Card appear again when Cards are Drawn then great attention should be paid to its meaning. 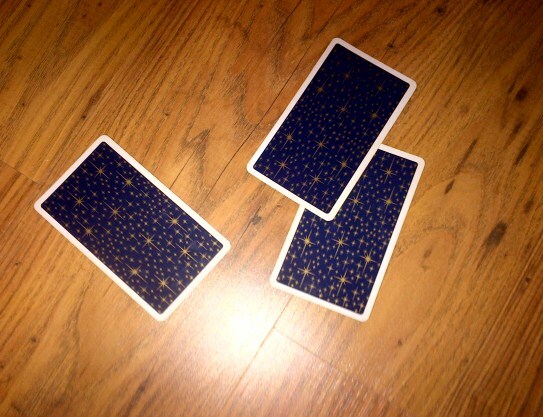 Jumping Cards usually involve one to three Cards jumping or falling out of the Deck during Shuffling. Once The Querant is satisfied that the Cards are Shuffled enough, The Querant places the Deck back on the table in front of them. Watch to Make Sure Querant Places the Deck directly Back onto the Table and does not turn the Deck around. Cards must be kept in The Same Orientation when Shuffling finished. The Reader, if sitting opposite the Querant at this stage either chooses to rotate the deck 180° before Card Selection or waits until Cards are in Spread Layout. In the latter case, instead of turning Cards over from left to right or right to left, the Cards are turned over from top to bottom or bottom to top. This keeps Cards in the same orientation they were drawn (very important when Reading Reversed Cards). Note – If The Reader is doing the Shuffling for The Querant, the Deck will not need to be turned around as they will have it in front of them. Neither will the Cards need to be turned over from top to bottom as they will be in their correct Orientation. It is only if they have to cross from one side of the table to the other does rotation by 180º come into play. The Reader sitting across from The Querant Rotates the Deck 180º after Querant is completely finished Shuffling and Reversing, so that they are in the same Orientation as when the Deck was sitting in front of The Querant. This keeps all the Uprights and Reverses as they should be. Depending on which method of Card Selection The Reader has chosen, The Reader either Fans the Full Deck or asks The Querant with their non-writing hand to cut the Cards three times to the right. If the Querant is doing this it should be done before the Deck comes back into your hands. The Reader/Querant places the pile on the furthest right on top of the pile on the furthest left, and the combined two piles (right and left) are placed on top of the middle pile. The Cards, using this method are dealt straight from the top one after another depending on how many Cards are required. If the Querant is using the Cutting and Piling Method, then they can do this after they have finished Shuffling and before you take back control of the Deck. (Remember that the Card Selection method decision must be made in advance as the subconscious needs to know which way to work). I personally do not using this cutting method. I Deal from the top of The Deck once Shuffling has been completed. I also check The Base Card and take it out to the side for further reference and explain its implications to The Querant. 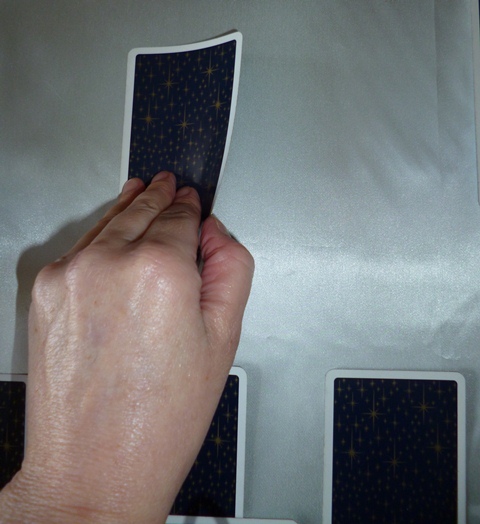 Note – If the Cards are being selected by the Fanning Method, the Base Card is taken note of and then put back into the Base of The Deck before Fanning. The Querant should not be informed of the identity of their Base Card if they will be scanning for Card Selection as it may taint the selection process. The Reader can inform them of their Base Card and its implications once all the Cards for the Reading have been selected. Once you find your own style of Shuffling, Cutting and Card Selection, stick with it as repetition of anything creates an energy pattern. If you are constantly changing your method of Reading, your own subconscious will find it difficult to keep up with what is expected of it. As with everything in life, establishing a routine is stabilising, grounding and securing. It also eventually becomes automatic. If Fanning Cards, make sure to give a wide sweep so as to expose as many Cards as possible. Be careful not to accidentally turn any Card around while Fanning. 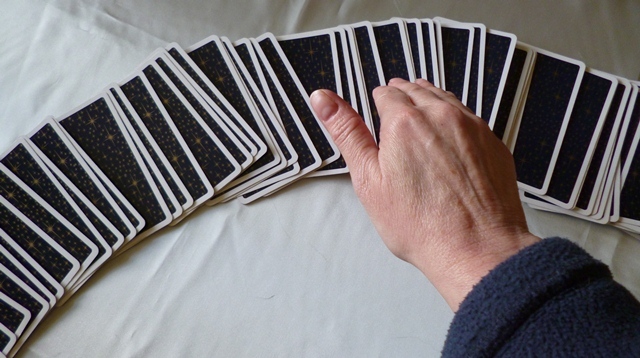 Ask The Querant to select the required number of Cards with their non-writing hand (their Dowsing/Sensing Hand). The Querant usually scans their hand across the Cards and stops over the Card they feel drawn to. They can either point to the Card or lift the Card and hand it to The Reader. It is a good idea to call out the Number and Position of each Card as the Querant selects them. This helps The Querant to focus and also the subconscious to thoroughly cooperate. 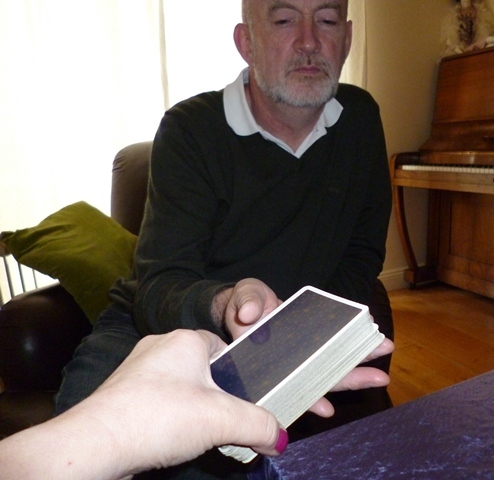 When The Reader is using the Fanning Method of Card Selection, the Querant scans their non-writing hand across the Cards until they feel they wish to stop at a particular Card. Their non-writing hand is their Sensing Hand and the one they use to pick up information or Dowse with. 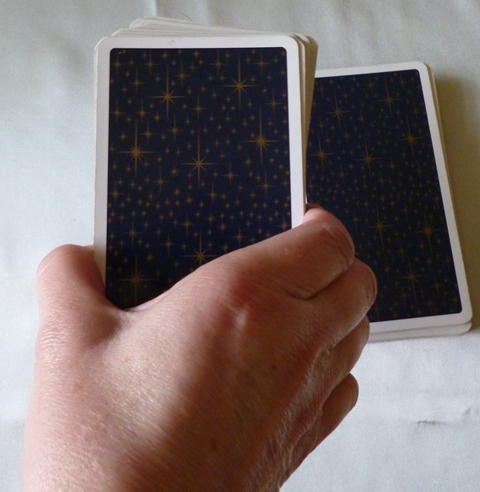 A tingling sensation is often felt in the fingers or palm of the hand which indicates which Card to stop at. The Querant takes this Card and hands it to the Reader. The Reader ensures the Card stays in the correct orientation. The Querant repeats this process until all the Cards have been selected for the Reading. The Reader can call out the Card Number and the Position each selection relates to before The Querant Scans as this helps the subconscious with the selection. Whether Fanning or Dealing straight from the top, check which Card is on the bottom of the Deck before Cards are selected for the Reading as this Card will hold important clues to The Querant’s situation. This Card is referred to as The Base Card. Checking The Base Card is done before Fanning. If you are Fanning the Cards place the Base Card back into the Deck where it came from before Fanning as the Querant may end up selecting this Card. Do not inform The Querant of the Base Card until after the Selection. The Querant having prior knowledge of this Card may deliberately select it. When Dealing straight from the Top, the Base Card can be taken out, shown to Querant and left aside as it will not be drawn from the top. The Cards selected must be kept in their Numerical or Position order and not mixed up. Take care not to turn Cards around. Focus on what you are doing? NB The Reader must remember the rules of Orientation when Reading Cards if working with Reversed Cards. The Cards must be Read with the same Orientation that The Querant selected. 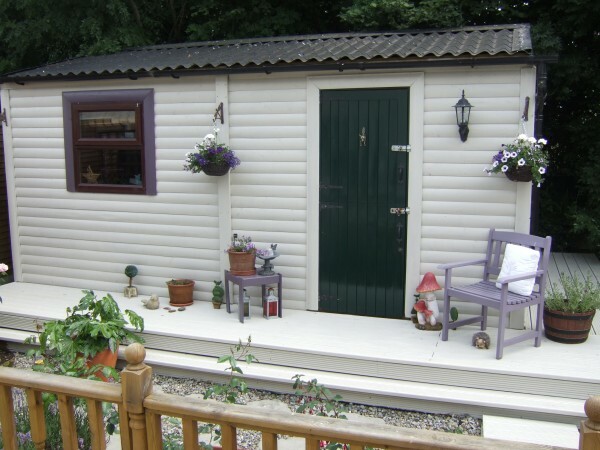 Therefore if you are sitting opposite your Querant you will have to turn the Deck 180º when it is handed back to you unless they turn them around beforehand. e.g. The Querant is sitting opposite you. She draws three Cards and if she were to look at them they are the 2 Wands Upright, the 8 of Cups Upright and the 9 of Swords Reversed. She hands the Cards to you and you Read them without turning them 180 degrees. The Reading will not be accurate as her Cards now are the 2 of Wands Reversed, the 8 of Cups Reversed and the 9 of Swords Upright. Her Reading will take on a whole new meaning. It may be interesting, but not hers, and not accurate. NB. If the Querant has a Specific Question, remember to stick to the Question and revert back to it regularly as you go through the Reading. It is useful if you write the Question down and have it placed at the top of The Reading. This will keep you focussed and stop you drifting off down irrelevant pathways. 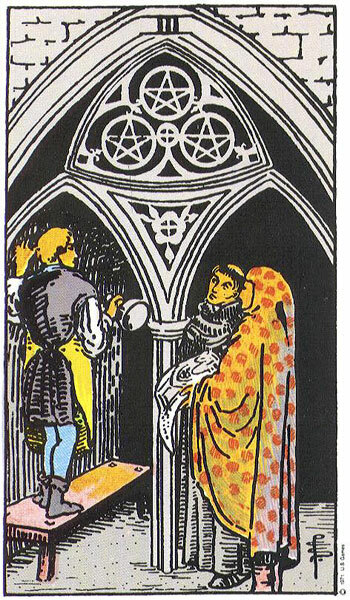 Regardless of what Cards are in front of you, they must be related to the Question or The Reading is pointless. Very often I hear comments made by people who have been to Readers saying things such as ‘they were very nice but they never answered my question’. On occasion, a Querant may ask a Specific Question but are thinking of something entirely different when Shuffling the Cards. Sometimes they do not want to mention this other issue as they are embarrassed or fear what you might think of them. This is known as The Hidden Question. The Question Placed beside The Reading. Keep referring back to The Question. This will help you stay focussed. This is a toughie but usually you get a gut feeling that the Question asked has nothing at all to do with why they are there for a Reading. This must be handled very diplomatically. I usually say, for example ‘you ask about your career yet a lot of Cups Cards are coming up and a certain Knight of Wands. Anything I tell you about the Cards you say bears little or no relevance to your Question. Are you sure that there is not something bigger on your mind that might be interfering with your Career Reading? The Cards don’t make sense to you but would they if there was another Question you might ask? The real issue may be that the Querant is having an affair with a married man in work and what she really wants to know is how it will work out? Elaborate Spreads and Layouts don’t always make for a better Reading. They do certainly make for a Longer Reading. If your Querant is expecting to address a few issues, keep to simple Spreads for each Question. Sometimes large or complicated Spreads can be too confusing and The Querant loses track of what is going on. Keep it simple especially in the beginning. 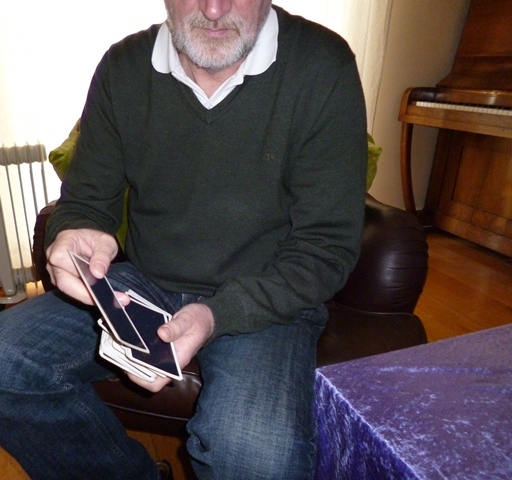 The Reader lays the Cards out face down in their Correct Orientation and in their appropriate Position in the Layout. Therefore the first Card selected is Number One and goes into Position Number One for whichever layout you are using, and so on for Card 2, 3, etc. Turning Cards Sideways if Deck is in Same Orientation as Querant Shuffled. Deck has been turned 180 degrees after Querant is finished Shuffling. This only applies if Querant is sitting opposite The Reader. If The Querant is sitting beside The Reader they do not need to turn the Deck as Cards will be in correct Orientation. If Querant is sitting opposite Reader and the Deck is not turned 180 degrees before Card Selection, the Cards can still be selected, laid out in the Spread but instead of turning Cards over Sideways, they are turned from top to bottom to maintain the correct Orientation before Reading. 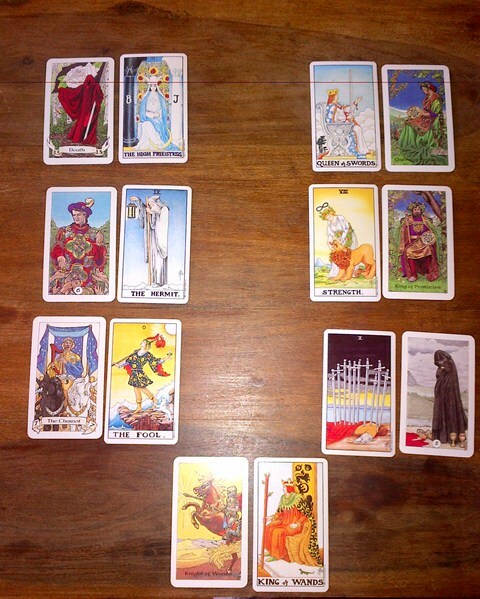 The Reader then turns each Card over sideways to reveal the whole Layout /Spread (top to bottom if you have not rotated the Cards. Rotating Cards 180º only applies if Querant is sitting opposite you when Shuffling and Reversing) and not one Card at a time. As you become more comfortable with interpretation, you may choose to turn over one Card at a time for interpretation. Sometimes the first Card can yield a lot of information but no Card typically stands alone in a Reading. Just like any story, there are usually many sides to it. It is best to get the overall picture by turning over all Cards first. The Reader explains to The Querant that she needs a minute to let the story come through. Take your time. The Querant will be anxious for you to start talking and will also scan your face to see if you are holding back on bad news. Think before you speak. You will need this time to scan for vital information. 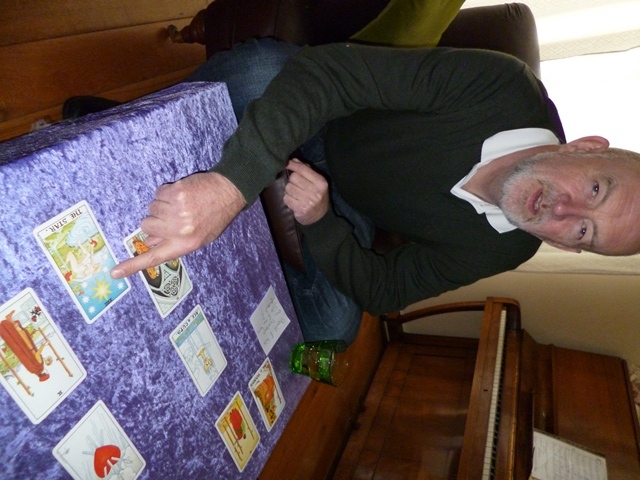 Taking a moment to get a general Impression of The Cards before starting into the Reading. Yes, everyone, the Tablecloth has suddenly changed as photos taken on a different day. Very poor continuity! Sorry. Photos are for Guidelines only. 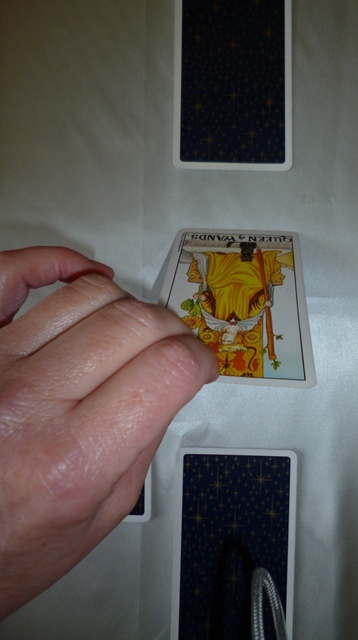 After Scanning for all relevant information, when starting off as a Tarot Reader it is safer to read one Card at a time for the Querant, starting from the Past Position and working from there with the exception of the Answer and Outcome Cards. Whichever layout you use, and wherever these Cards are placed in the Spread leave them to last. As you progress as a Reader you will find that you can hop with ease from one Card to another, backwards, forwards and sideways making connections and pointing these out to The Querant as you go. If you immediately go for the Answer and Outcome Cards, The Querant may not listen to anything you have to say in between, especially if it is not what they had hoped for. Even though you will not be immediately addressing The Outcome and Answer Cards as a Novice Reader, you will have scanned them without relaying any information to the Querant. Are they both Upright? For a definite Yes, Thumbs Up, both need to be Upright. Are They both Reversed? This generally indicates No, or a Thumbs Down. 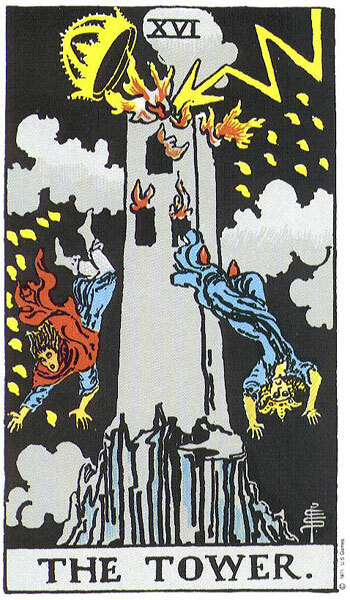 The exception to this is when the Reversed Cards are more Positive when in their Reversed Position as in The Reversed Eight of Swords or The Reversed Devil. Try to hold out on giving detailed information about these Cards to the Querant until you have addressed the other Cards in the Reading. If they are obviously Negative, it will be hard to hide their implications, but try not to be drawn into discussing them until the Reading has been worked through. As mentioned earlier, The Querant may shut down and hear nothing of what you have to say about the rest of the Reading if you go straight into the ins and outs of any apparent Negative Outcome or Answer Cards. Obviously if they are wonderfully Positive, it will be hard not to share this good news with The Querant, but remember the rest of the Reading may throw up some curve balls they weren’t expecting. Be cautious about jumping to conclusions too early on in the Reading. Let it slowly develop and let the story unfold stage by stage. Regarding The Outcome and Answer Cards, Is one Upright and the other Reversed? This could point to delays, setbacks or blocks to achieving the desired Outcome. Are they Minor or Major Arcana? If they are Minor and the Outcome is undesirable, then the Querant is more than likely in the position to change it. If they are both Major and Reversed, then the Outcome is likely to be fixed and little can be done to change it. One Major and One Minor, then small changes can be made but compromises and disappointments are likely (this is only if The Outcome and Answer is Unwelcome or Negative to The Querant). If both are Reversed, trying drawing a Card for each at the end of The Reading with the intention that the Cards selected will reveal the underlying issues. Remember, that nothing is black and white. Learn to find the grey and how to read between the lines. Welcome or Unwelcome, Say little unless they are very positive. Explanations can come later and the rest of the Reading has yet to be gone through which should bring greater understanding to the Outcome and Answer Cards. 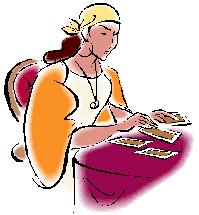 When you get more experienced as a Tarot Reader, you will be able to sum up a Reading pretty fast as soon as the Cards are turned over. Then you will be in a position to refer to the Outcome and Answer Cards with more conviction and confidence before commenting on the rest of the Reading. You will quickly be able to know the difference between a Positive and Negative Spread. Remember to keep coming back to the Question if it is a Specific Question Reading. Are the rest of the Cards mainly Upright or Reversed? Pay close attention to Reversed Cards and any Cards that lie opposite or diagonal to them. These are blocks, set-backs or aspects of the issue the Querant may be unaware of or is trying to ignore. They may also be their blind spots or represent their Shadow Self. If the Reversed are Court Cards, they may be referring to the Querant or someone they are having trouble with, or someone causing trouble for them. If the Reversed are Major Arcana they probably represent deep consistent underlying issues that are driving the situation. These may require extreme effort to overcome. Also pay close attention to all Upright Major as these carry strong messages and are tied in with The Querant’s Destiny. What impressions do you first get? Are these happy or sad Cards? If the Cards look happy then say so immediately as in “these are wonderful Cards” etc. if they are very negative do not say so as in “God, I don’t like the look of these Cards”. Rather sympathetically acknowledge that they are going through a tough time and draw out the potential positive aspects of the Reading. Tread carefully with any negative meanings. Remember that a Tarot Reading is supposed to be constructive and not destructive. It is also possible that you might be wrong. Nothing is ever set in stone with Tarot. Which Suit dominates the Spread? If a lot of Cups then emotions/relationships are forefront etc. even if it is a Business or Career Reading. An abundance of Swords and you are more than likely looking at conflict or severe stress. 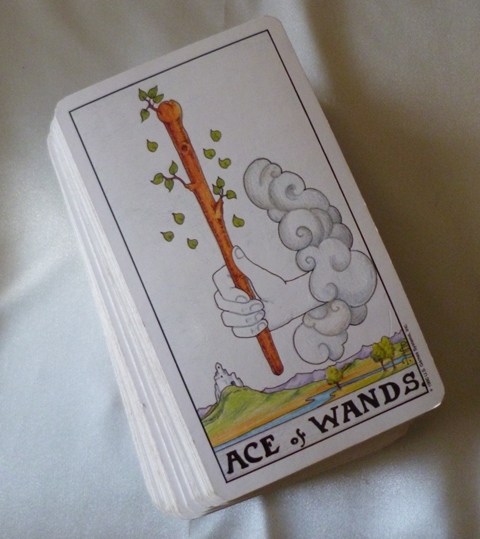 Wands dominating, then travel, action, movement, career and high energy figure. A lot going on. 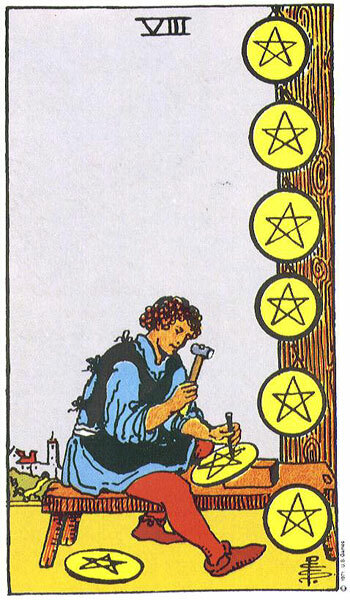 If Pentacles rule the day then finances, work or health may be the issue. Are there many Court Cards? Upright or Reversed. These are normally the people around The Querant having either a positive or negative influence on the situation, or The Querant them self. However, they may be conveying an atmosphere or messages in their style of personality. Do a quick numerical summary of the Cards. Do you have several of a certain number? This will be relevant to the Reading. A lot of Aces or One and there may be a lot of new beginnings for the Querant. Several Nines or Tens and we have the end of a cycle causing issues or disturbance. Too many Fives, and the Querant may feel like they are caught up in a cycle of upheaval, unpleasant change and everything going wrong for them. Take your time checking this out and get familiar with the energies attached to each number. The Quintessential Card although connected to The Major Arcana, I will give an explanation now and cover it again in Part III. 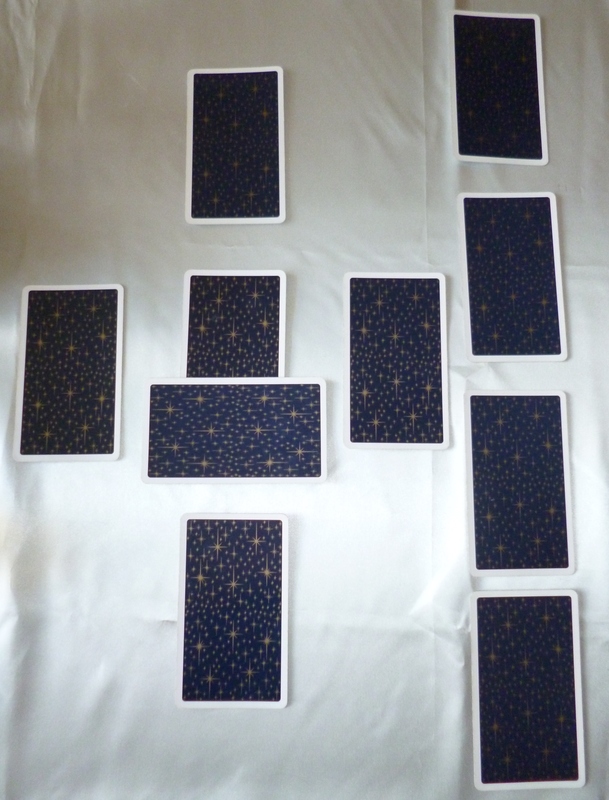 In a Spread once all the cards have been laid out and interpreted, add their numbers together, i.e. the number on top of the Card. Aces count as 1, The Fool, and all the Court Cards count as 0. The sum of the remaining digits will give you your Quintessential Card. 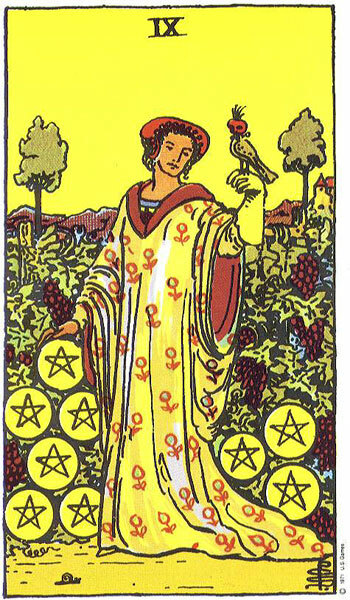 So when all your Numbered Cards are added together and they equal 14, your Quintessential Card is Temperance. This number can also be broken down to give added information so 1+4=5. 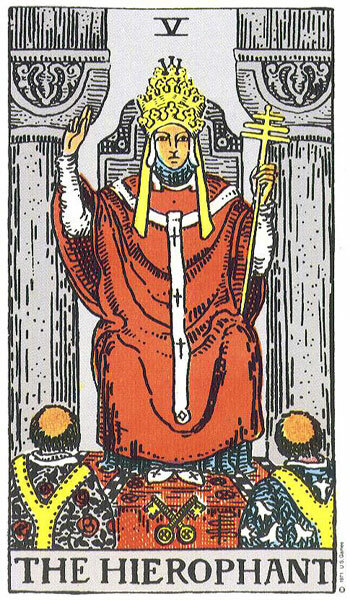 Five in the Major Arcana is The Hierophant and one would look at what message Temperance carries in relation to the often rigid outlook and beliefs of The Hierophant. As Temperance deals with balance and healing, this may be very appropriate when it comes to solving your problems and should also relate to your Reading. If the total of the digits exceeds 21 (the final number on in The Major Arcana) then as in all Numerology, the number must be reduced down until a number between o and 21 is arrived at. So if the sum of the digits in your Spread is 26 then it is broken down as follows 2+6=8. Therefore, you Quintessential Card is 8 and 8 in The Major Arcana is Strength. It is interesting to see how relevant the Quintessential Card is to the summary of your Reading. You can get a 0 as the total sum of the digits in your Reading if your Spread is small and only contains Court Cards or The Fool. 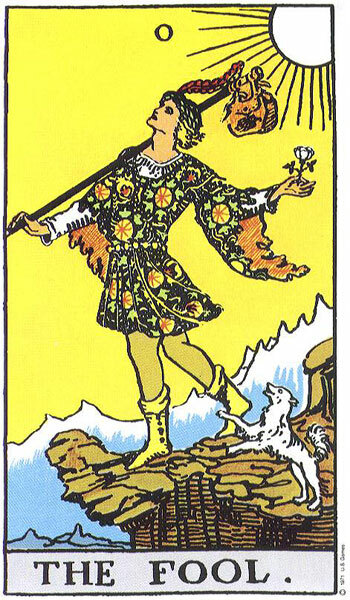 Then your Quintessential Card will be 0 which corresponds with The Fool in The Major Arcana. If using Numerology, Keep at the back of your mind The Querant’s Personal Year Number and their Destiny Number. Are there any correlations between their Numerology Numbers, those of their Reading and their Quintessential Card? Do any Cards carry similar meanings, are there commonalities? These are reinforcing Cards and make Reading much easier as their messages are quite clear and strong. Are there recurring symbols e.g blindfolds as in Two of Swords, Eight of Swords and the bandage around the head in the Nine of Wands? If so then they are reinforcing the message contained within them. 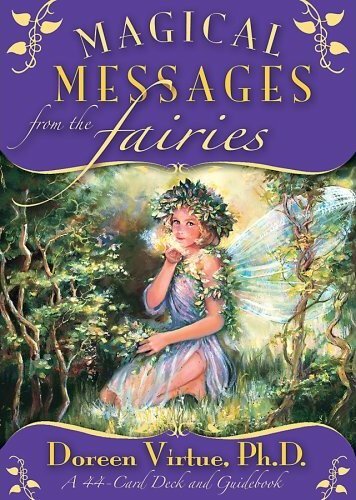 These messages will be symbolic and it will be up to you, with the input of The Querant to determine their true nature. The blindfolds may symbolise The Querant’s reluctance to face the truth or facts. Maybe they are turning a blind eye to something that is going on, choosing not to see and not get involved. They could also be symbolising an inward retreat or withdrawal of The Querant or that The Querant needs to withdraw from a situation and external distractions so that they can think clearly. Surrounding Cards will give clues. Do you see any combination Cards? Pregnancy, marriage, travel etc. For example, Ace of Cups, Nine of Pentacles, Empress, Three of Cups may suggest Pregnancy. Do you see any combination Cards for Zodiac Signs? 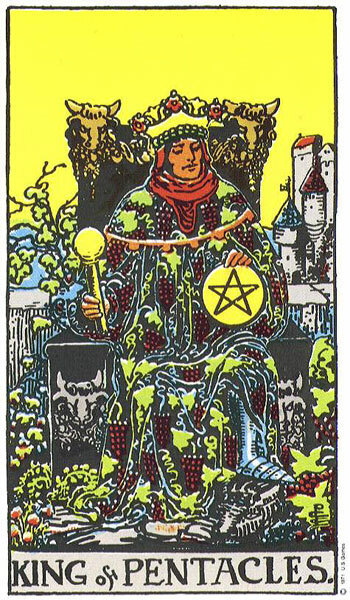 Example, The Knight of Wands and Temperance. There may be a Sagittarian involved. 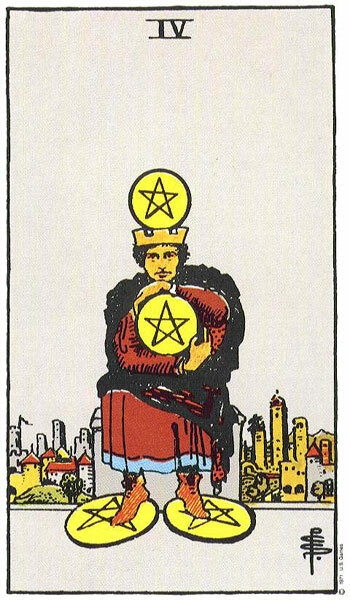 The Hierophant, The King of Pentacles and The Four of Pentacles. Then there may be a Taurean around. When Reading, touch each Card as you read it. This connects you with the energy of The Card. Point out the Imagery and symbolism to The Querant if you think they are engaged enough in the Reading. If a particular Card makes absolutely no sense even after you have drawn extra Cards, do not be tempted to keep drawing more. Let The Querant know that it makes no sense to you and leave it aside for the moment. You can always go back to it later. You will be surprised how relevant it may be after you have gone through the remaining Cards or the Querant may surprise you by spotting something in the Card that you didn’t. There are times when a Card turn up in a Reading that has no real meaning you can discern. They are just Cards that happen to slip in. Do all the Cards appear to be in conflict and make little sense? Do they seem fragmented with their meanings all over the place? Can you see no rhyme or reason to them? Can you not pull a storyline out of them? Does it all seem disjointed to you? When this happens you will have to interpret each Card individually until you begin to piece the jigsaw together. You can describe them out loud if you wish. For example the Three of Wands. I see a man standing with his back to us looking out to sea. 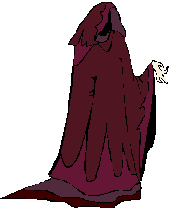 He is wearing a red cloak and holding a Wand. Below are boats coming and going. We cannot see his face but he seems to be looking out to sea or at the boats. Something you say may trigger a memory or connection in your Querant’s mind and this might be enough to get the Reading going. They may not make sense to you but they may to The Querant. Life is strange!! Communicate their interpretations to The Querant and wait for their reaction. If you arrive at a blank, draw some extra Cards to flush out the message. If nothing appears to work, put all the Cards back in the Deck and ask the Querant to start again. This time ask them to concentrate fully on their issues. This may or may not sort things out for you. You can only but try. Sometimes you will get a Querant that you just can’t read for. It happens to all Readers. As alarming as this may seem, do not let it put you off. Of course, as mentioned earlier, the Reading they have asked for may not be the Reading they really have on their mind. Ask them if they are sure that these Cards are not relevant in some other area of their life regardless of the Question they have asked? It could be a case of ‘The Hidden Question’ scenario. Along with The Hidden Question comes the possibility of another form of Tainted Reading. The Querant has asked a question but cannot remain detached from the Potential Answer he/she might receive. They are not prepared for unwelcome news. Therefore during the Shuffling and Selecting Process they are wishing, hoping and praying for certain Cards to appear. They are not prepared to let go and just see what comes out. Their subconscious may very well decide to cooperate with them. What comes out might easily be what they had dreamed of and all looks rosy and very promising. When a Reading looks too good to be true, it might be a sign that it is exactly that, too good to be true. The Querant may have forced the Cards by encouraging his/her subconscious to help them select the Cards that will make them most happy. A sign of this is when you see too many Stage Cards, too many happy-clappy Cards that might smack of wishful thinking rather than reality. If the Querant has come to you because of Relationship Issues, cheating and infidelity on the side of their Partner, a Rose-tinted Spread of Cards may be hard to believe. Again you must tread very carefully here and a good idea is to do a Double Spread Reading. 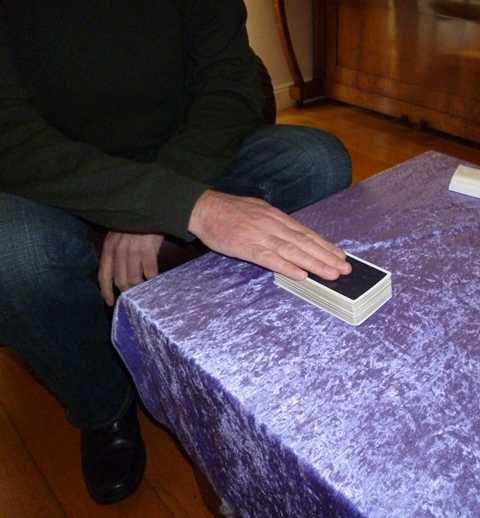 A Double Spread Reading uses a Second Deck of Cards Shuffled and Selected in the same manner. The intention with the Second Deck is to seek the other side to the story, a second opinion as such. The Second Selection of Cards are placed in the exact same order as the first, right beside the first Spread and then turned over. It is not surprising to see a whole other side to the story exposed. Somewhere in the middle of all this lies the truth of the situation and you will need to work hard to find it. You will also have to ask the Querant some strong Leading Questions. The Double Spread Involves using Two Decks of Cards which are shuffled separately. The Intention with the Shuffling is to get The Two Sides of the Story/The Conscious and Subconscious Aspect/ to Flush out a Hidden Agenda or Question. The Double Reading gives a more balanced view of what is going on. Here I have used The Rider-Waite-Smith and The Robin Wood Decks. It is perfectly okay to ask questions of The Querant. The idea that The Querant gives nothing is nonsense. That is the realm of Fortune-Telling and nothing to do with Tarot Reading. On the other hand, you do not want them to tell you everything as you need to remain objective and not biased in favour of The Querant. Just brief answers to your questions are suffice. You can ask several questions as long as they are not prying. Try to figure out as much as you can on your own. 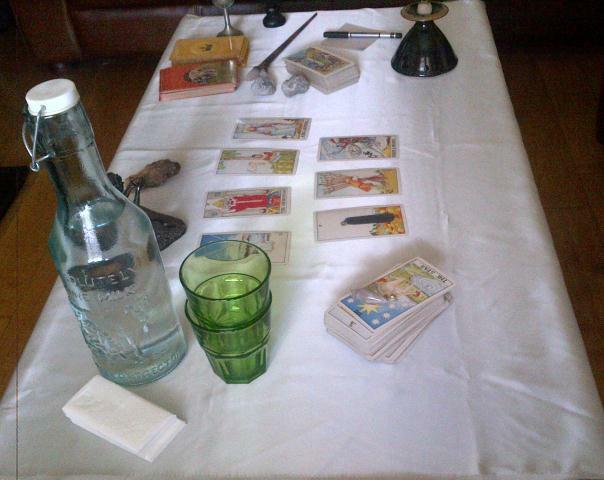 A Tarot Reading works both ways but it is not an interview or an interrogation. You do need feedback and some input from The Querant however. It is not that you are secretly extracting information from The Querant with the view to then feeding it back to them; you are just looking for confirmation on your findings and a few comments here and there. One pertinent comment from The Querant in relation to a question you ask can open the flow of energy in the Reading. Very often the story begins to unravel in front of you after this. When this happens, the Cards begin to fit together like pieces of a jigsaw. The Querant will also be delighted that the Reading goes so well. There are many meanings associated with each Card. Input from The Querant can greatly help you get on the right track. So much more will be got out of a Reading when there is a two-way flow of communication. Remember you are controlling the Reading, You are Professional. You must Guide your Querant through their Reading. They will be relying on you to do this. Ask The Querant to point out any Cards that have strong significance for them as in imagery, colour etc. Ask them what the Card means to them and what they see in it? Often what they see does not relate to the Card meaning but something within the Card has had a personal effect on them. This should be taken into consideration when Reading. E.g. 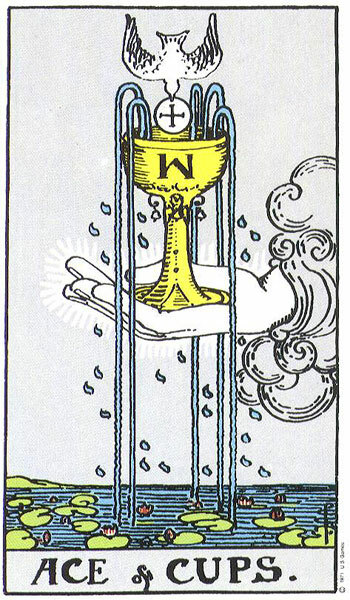 maybe The Three of Cups reminds your Querant of the Shakespeare play they are making the costumes for and not the traditional meaning of celebration and reunion. 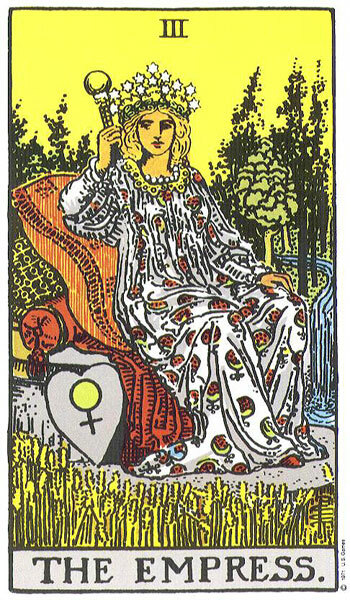 However, any Tarot Card in a Reading can be relaying several relevant messages all at the same time. 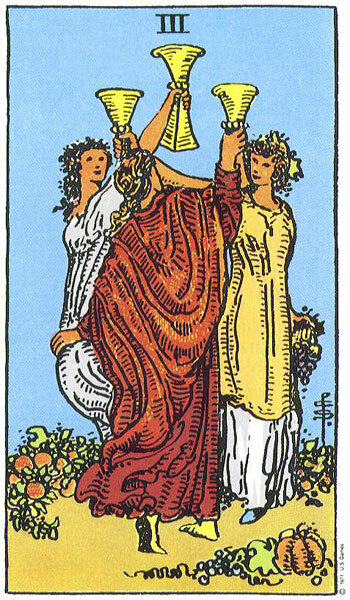 Yes, The Three of Cups may appear to The Querant as a representation of their costume making, but it also might be telling of the success of the play, the celebrations after teamwork, and the joy of making new friends. Also ask The Querant if they have any questions in relation to what you have been telling them about their Reading. The Querant’s Input – Pointing out Cards that are significant to them and asking questions during the Reading. The Querant is often drawn to particular Cards during their Reading and want further information about them. NB. Don’t be tempted to tell The Querant just what he or she wants to hear. This does no one any favours and will only ruin your reputation as a Reader. If The Querant desperately wants to marry the man she is currently dating, and you see this relationship not working out, then you must find a way of telling her in a compassionate and constructive manner. Let her know that you do not see anything happening in the immediate future but that she should make time for her friends and self-development for example. If you tell her no immediately, she will just shut down and any positive aspects about a new man you see in the Cards or exciting travel related to career will go unheard. 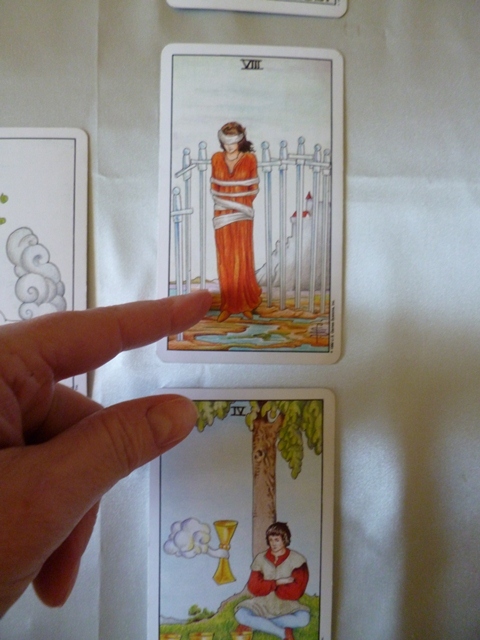 You must bring the Reading around very subtly to the more negative aspects or disappointing news. You will always get Querants who just want to be told what they want to hear. If you don’t cooperate, then they are likely to tell you that they got nothing out of the Reading. They will generally go from Reader to Reader until they find the one who will give them what they want. 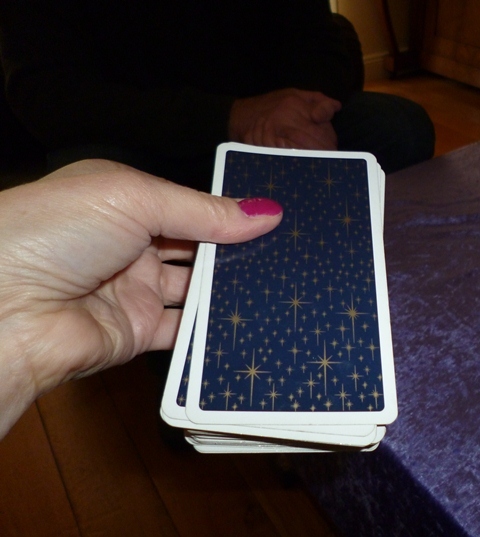 If The Querant does not like the Outcome or Answer to the Question asked, carefully remind them that Card Readings are based on the Probable Outcome of Events which are based on the current behaviour, attitudes, actions, beliefs etc. of The Querant. If a different Outcome is desired The Querant has the power within themselves in most situations to change things. We cannot force change on anyone else. However we can change ourselves for the better, and in doing so the world around us reacts to us in a more positive manner. By giving a Constructive Card Reading, pointing out the good, bad and ugly bits, it empowers The Querant to make any changes he or she thinks necessary to achieve the desired Outcome. Note – When the Outcome and Answer Cards are Unwelcome Majors, then it will not be so easy to change as they are more fixed in nature and can indicate that the Outcome of the situation is not in the control of The Querant as it may be out of their hands. The Outcome may be connected to their Destiny or Karma. They may also be trying to force a situation that is just not meant to be. They may think they know what is right for them but their Cards may be telling them otherwise. It is not always easy for the Querant to hear this and they may ask several questions about the possibility of certain Cards meaning something else. You can tell them that they may very well be right but from your interpretation this is how you are Reading it. Very often they will leave, still in denial about their situation, convinced that they have it right and their Cards were wrong. They might be right and this is why you must inform them that even though you are interpreting their Cards in a certain manner, it is only your interpretation and they have to do what they feel is right for them at the end of the day. The Cards may be wrong. 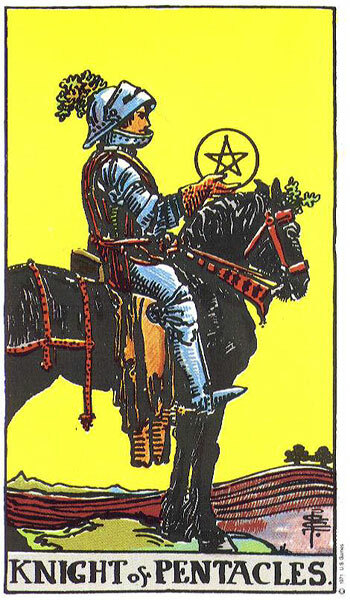 If the Cards have been right, and generally they will be to some extent, even on the worst of days, the first seed has been sown in their mind, the first shot fired, and disgruntled as they may be with their Reading they may eventually come around to seeing their situation differently. However, this may only come about after visiting several other Readers and Psychics who relay them similar interpretations. There is nothing you can do about this. Use your imagination when Reading Tarot and be yourself. Bring your own unique personality and style to the Readings. Remember to bring wit, humour and life to the Readings and compassion and sympathy where relevant and necessary. Learn how to be expressive, even down to hand and arm movements to help The Querant understand the message you are trying to convey. Don’t be Scary. If you see a car crash in the Cards in the future, tell The Querant to take extra care when driving, to get her/his car fully checked out, to ensure everyone wears seat belts, that tyres are not worn thin etc. Don’t just blurt it out. If you see Cards that suggest theft or robbery, advise the Querant to be more security conscious with their possessions and property. Check alarms and locks. Most Querants are nervous to some extent before a Reading but some are more so than others. Don’t add to this with a fatalistic, doom and gloom approach. Remember there are no totally Negative Cards in Tarot as each Card has something to teach us. The Scary Reading – Reader should not show shock or communicate fear to Querant if Spread is full of apparent Negative Cards. Act Professionally and keep your cool. Be prepared for tears. Card Readings bring up a lot of emotional and psychological issues for people, so tears are very common. Don’t get embarrassed. Instead give them your permission to cry, and be supportive and empathic. Always have tissues nearby. Allow them time to compose themselves before carrying on. Tears during a Reading is usually an indication that The Reading is actually going very well and the information you are relaying is touching home with them. Once you put yourself in the role of a Tarot Reader people treat you differently. You may only be new to Tarot Reading, but once the Cards come out, you will instantly take on the role of friend, psychic, medium, spiritualist, sage, counsellor, psychotherapist, agony aunt and guru. During Readings people will often open up and tell you things that they have told no one else. Be prepared for this as it is not question of it possibly happening to you, it is more a guarantee that it will. When Reading for Friends and Family you must inform them before the Reading that you will be dealing with them differently when Reading for them. You will no longer be their Friend or Family member in the normal context; the person who is going to tell them what they want to hear, take their side or be biased in their favour when Reading their Cards. Explain to them that it is essential you maintain a Professional Boundary when Reading for them and that not one word of what they say will be conveyed to anyone else in your social circle or family. Help them understand that you must remain objective and detached to get the best out of the Reading. Outside the Reading Room you will return to being their Usual Friend or Family Member. 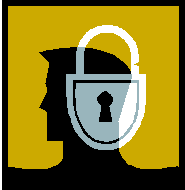 Of course the above takes us into the realm of Privacy and Confidentiality. Confidentiality is vital when Reading the Cards. Querants will rightly assume that what you see in their Cards and what is discussed between the two of you will not be made public knowledge. They will class you in the role of a doctor who is not at liberty to discuss his patient cases with a third party. You will quickly learn secrets about friends and neighbours that would be disastrous should they get out. However in extreme cases of emergency, such as a threatened suicide or threat of harm to another, then steps need to be taken. It may be necessary to phone the authorities or a member of their family who may be able to help. Also, should you feel the issues surfacing in the Cards are very dark, carefully suggest that The Querant see a doctor or seek counselling, Samaritans etc. Don’t try to tackle something that you are not qualified for. Keep a list of services, organisations and helplines on hand to give to Querents you are concerned about. If you are very concerned but unsure of as to what to do, make contact with another experienced Reader, and without giving personal details about your Querant, ask for their advice. You could also ring the local authorities, doctor or professional therapist in a similar manner. Where privacy is concerned, make sure you conduct your Readings in an area where others are not privy to what is being discussed. This can be hard to do when Reading at Holistic Fairs, but generally in these cases the Querants realise they are standing or sitting within earshot of hundreds of other people. Another area to be careful about is meeting people out on social occasions who happen to be clients of yours. You need to tread carefully here and not just blab out that you know so and so because they are a client of yours. 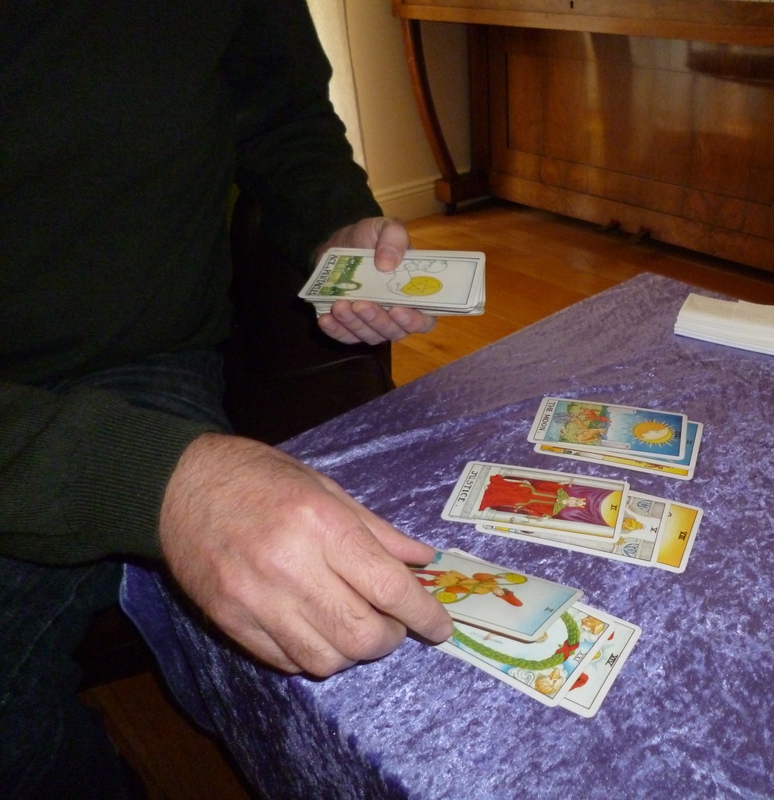 Your client may not want others to know that he/she attends a Tarot Reader or Tarot Consultant. Just be polite and act as if you are only meeting them for the first time. Of course all this goes out the window if they rush over to you and announce to others that you are their Tarot Reader. Do not be drawn into discussing their Readings in front of others regardless of how enthusiastic they might be. Do not diagnose medical conditions unless you are suitably qualified to do so. Yes, there are Health Meanings attached to The Tarot but these should only ever be alluded to and not discussed in-depth. 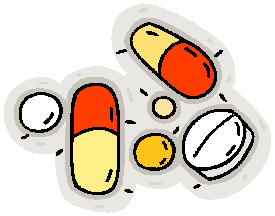 If you see ill health in a Reading, then suggest they see their doctor for a check-up as they may be run-down. Swords Cards often have me warning Querants about the dangers of constant stress in their lives and they generally agree with me. I then encourage them to seek a way to deal with it. Many, many a time, I suggest that a Querant would benefit from some counselling or therapy. This is very different to telling a Querant that you think they have heart disease or are suffering from a mental health condition. Of course you can ask them if they have any health issues when you see certain Cards appear but do not be specific. The Ten of Swords often represents back problems and again this is very different to telling them that they might have cancer. Reversed Wands often suggest physical or nervous exhaustion while Reversed Pentacles in Health Readings can suggest, weight issues, poor nutrition and lack of physical exercise. Can you see the differences between discussing such general Health issues with your Querant and telling them of life threatening diseases you think they might have? *Remember, you are a Tarot Reader or Tarot Consultant, not a Doctor or Medical Specialist. The Same applies for Professional Legal or Business Advice. Even if you are a Professional in any of the above areas, you will not use Tarot Cards to diagnose a patient or give specific legal or business advice. You would probably find yourself quickly struck off the official list of accredited professionals in your field of expertise if you were found to be using Tarot Cards with your clients. 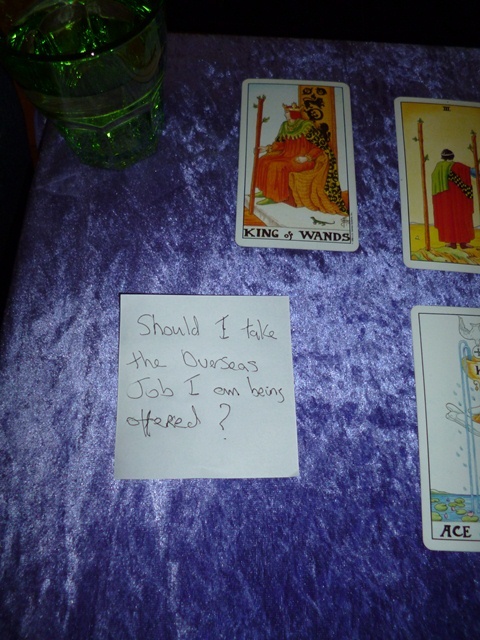 This is not to say that doctors, lawyers or business consultants can’t be Tarot Readers as well. Just not at the same time. 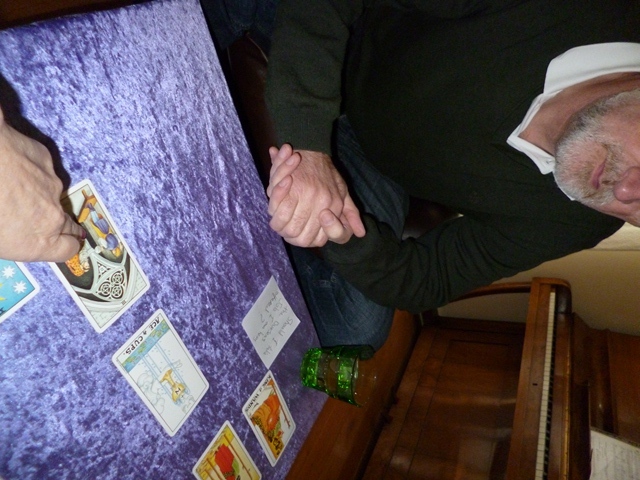 At the end of the day all Tarot Card Readings are subject to interpretation. Another Reader may get a completely different set of meanings from the same Cards in the same layout. Never be absolute about a Card or the Outcome. The Querant may literally act on the Card Reading and your advice. It could very easily be wrong and you may be held responsible for this. If you have led them to believe that everything you have seen in their Cards is gospel, then they may close themselves off to new opportunities, ideas or life changes. The Querant must always do what he/she feels is right at the end of the day. All you can do is make them aware of situations, make constructive suggestions and show them the Probable Outcome of events based on their current patterns of behaviour. Never should a Card Reading interfere with the Free Will of the individual. The Querant owns their Tarot Reading. The Tarot Reading does not own The Querant. If you wish have a Special Timer set it for about about 10 minutes before the end of The Reading. This gives you the time to finish up the Reading. 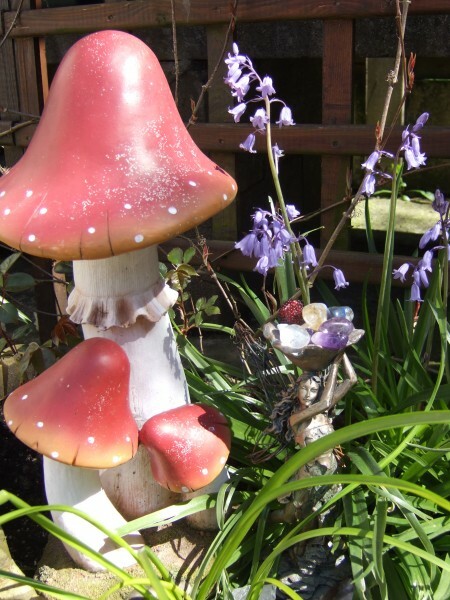 There are some lovely appropriate timers set into Angels or Fairies available to buy which will not come across as noisy or interfering. If you are using a normal timer, make sure the volume is not too loud as this can be very unsettling and does not create a nice atmosphere. Any decent mobile/cell phone these days have several alarms or notification rings and tones that can be selected to suit the occasion. 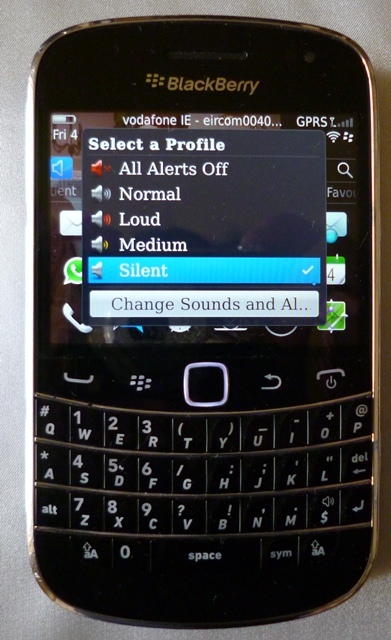 Even though your phone will be on Silent, the Notification Alarm will still sound. Time can run away with you during a Reading unless you keep a check on it. Round up the Reading by going briefly over the main points but don’t let it drag on. Some Querants will want you to go on and on, going over the same points several times just so that they can hear more about themselves. Gently but firmly draw the Reading to a close by gathering up all the Cards and putting them back in The Deck. This is the perfect time to get some feedback about the Reading you have just done. Ask them how helpful The Reading was and what they got out of it as you stack the Cards. Did they feel their Reading was beneficial? Had it helped clear up some issues for them? Do they see things from a new perspective? Has it been constructive in moving them forward? Has it highlighted areas they were unaware of or thought irrelevant? These are casual but mannerly questions that can be asked as you tidy up. Do not allow this feedback time to drag on with the Querant going over their situation all over again. If you have a box or bag you store the Cards in, now is the time to put them away. Another way of finishing up a Reading is to allow The Querant pull a couple of Angel/Faerie/Animal/Goddess after a Tarot Reading if you have the time. A Tarot Reading can be very intense and the Softer Cards add a light gentle touch to balance the energies. These Cards are not for you to interpret as messages are usually written on the Cards. You can be tidying your Cards away as The Querant reads their Special Messages. Make sure you have some Business Cards and Brochures in clear view of your Client. Move away from the Reading Table to get one of each and offer them to your Client for future reference. Ask if they would like a few more for potentially interested friends or family members. Now is the time to sort out payment for the Reading, and for some Readers it can be an awkward moment. Clients in general, once you stand up and move away from the table take this as a signal for them to do likewise. You are not showing them the door, but it is a subtle way of getting them up and out of their chair as some Clients have a tendency to linger if you continue to remain seated. Very politely ask them if they would like to settle up with you now for their Reading? Most Clients do not need to be asked, and once you stand up and move away from the table will reach for their handbag or wallet and begin to take out money. However, there are some who will drag it out to the very end before offering payment. 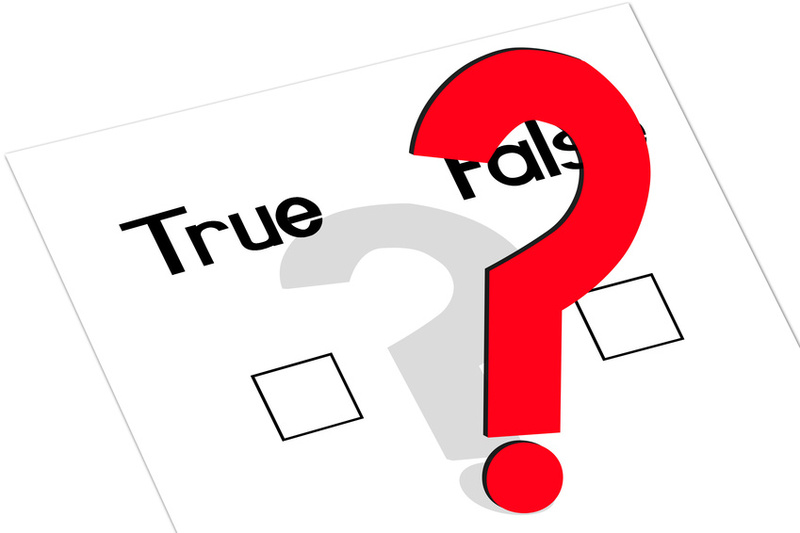 Some Clients will ask you how much they owe, even though they have already been told on the phone and by brochure. Others say nothing and begin heading for the door, coat or jacket on, leaving you in the embarrassing situation of having to remind them that they haven’t paid you yet. I have had Clients walking out the door and heading for their car, with me as dignified as possible running after them to get my fee. If at all possible try to have a cash float of some sort as even though you may have asked them to bring the exact amount, they often forget this and offer you notes that require change given. If you don’t have the change, you will find the Client very reluctant to hand over the money on the basis that you will owe it to them, or that they can call back for it. They will expect you to take less as they will think it your fault for not having change in the first place. I have been caught by this on several occasions. Clients will promise to drop the balance into you on another day, but it rarely happens. Then you have some wonderful Clients who tell you to keep the extra money as a tip because they really enjoyed their Reading and got a lot out of it. I have some regular Clients who turn up bearing lovely gifts for me and also pay me more than the required fee because they really appreciate all I put into their Reading. By the way, some Clients will expect a receipt so ensure you have a receipt book handy. If your Client has come to you regarding an ongoing situation or drama, they may ask when they should come back to you for a follow-up Reading. Depending on their situation and issue they may need another Reading the following week to monitor their issue, or then again in a month’s time. You will have to work this one out for yourself. 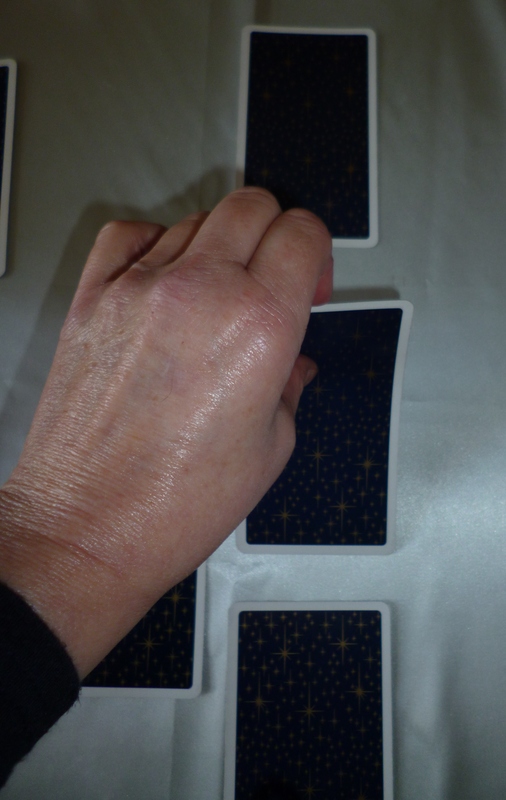 For Clients who just enjoy getting their Cards read, I usually suggest leaving a gap of at least two to three months as it should not be necessary to come back any sooner. 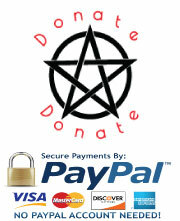 This is also to prevent some Clients from becoming Tarot Junkies. All said and done, there are Clients who like to Chart their Progress through Life by coming for Monitoring Readings every few weeks, and if that is what they want, there is no problem with that. Before your Client leaves ask them if they need to use the Restroom. When they are finally ready to leave, walk them to the door, thank them and shake their hand. Wish them luck with their situation. When the door is closed, let the Reading go. This can be difficult to do if you are at a Holistic Fair where there are queues waiting to see you. In this case find a way of achieving it with the least amount of time. I often see other Readers get up off their seat after each Reading and walk around their allotted space with a little bell ringing it while muttering a few words to themselves. Others walk around their table and clap their hands to disperse any stagnant energy hanging around. I have also seen Readers use Feathers or Crystals to achieve the same. 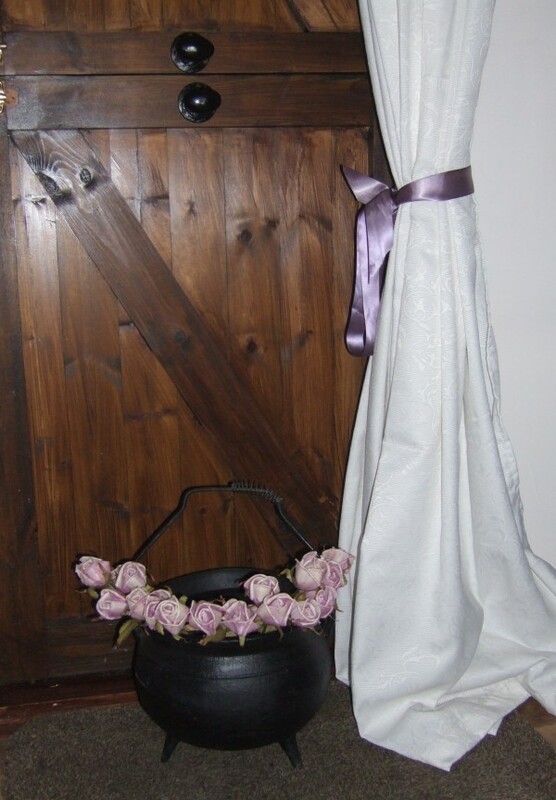 When you are not using your Tarot Cards, and in between Readings, they can be stored in wooden boxes or any natural fabrics such as cotton, velvet or silk. Tarot Cards, like Crystals will pick up Energy from the surrounding atmosphere and environment. Therefore they should be stored safely and in an area you consider sacred. For you this might be the cupboard in your sitting room or bedroom. You might like to place a cleansed Crystal on top of them for protection. 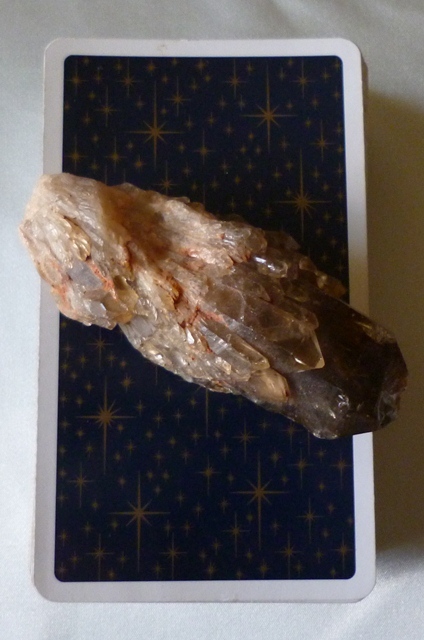 Smoky Quartz is a good heavy duty Crystal for clearing Heavy or Negative Energy. So too is Amethyst. Clear Quartz can be used to Charge the Cards before Reading. 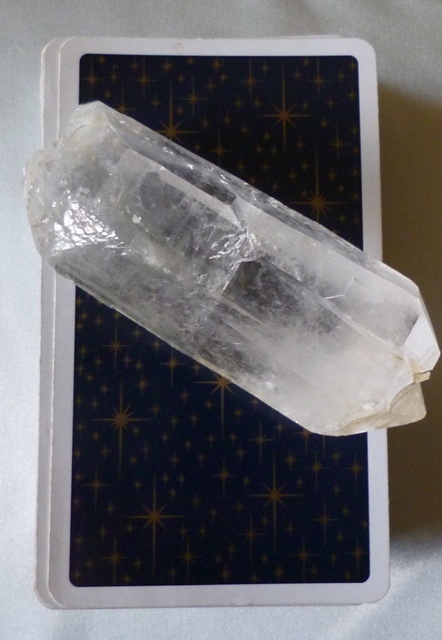 After Cards are Cleansed prior to a Reading, just place a Cleansed Clear Quartz Crystal on top of the Deck until you are ready to Read. It is very important that the Crystal itself is Cleansed. You can Cleanse Smoky Quartz, Clear Quartz and Amethyst by placing them in a glass container of spring water with a couple of spoons of sea salt. Leave them overnight. Do not use tap water. Sea water is excellent if you have it close by. NB. Some Crystals dissolve in water so you must check in advance if this type of cleansing is suitable for them. I will be making my Simply Crystals Manual available as a Mini Course in the near future. For those who wish to learn more about Crystals and their various uses, the Manual contains lots of information. This is where I store my Cards when not in use. 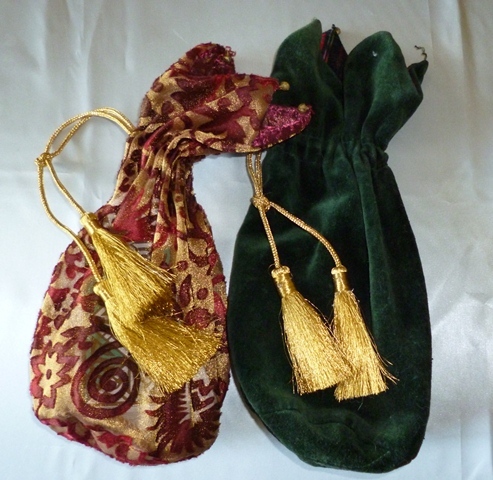 I have nicely decorated bags in silk and velvet. 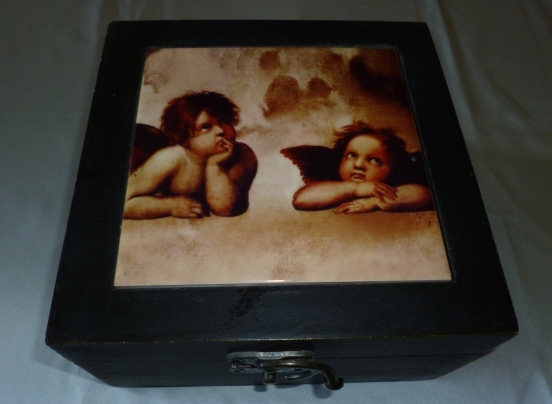 I also store Cards in my Wooden Cherub Box. Cleansed Crystal left sitting on top of your Tarot Deck can help protect them from picking up stagnant energy and will also clear them of residual heavy energy left over after an intense Reading. Clear Quartz, Smoky Quartz and Amethyst are excellent Cleansers of heavy energy. 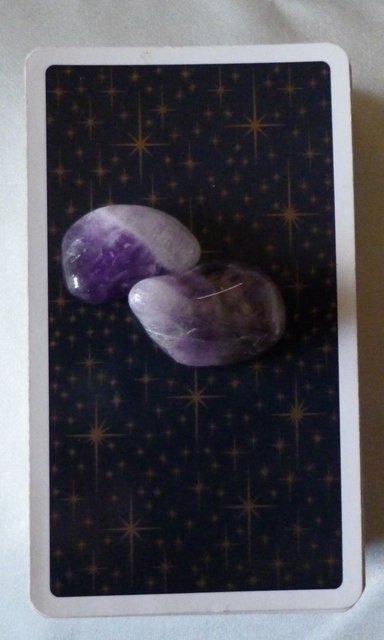 Ensure Crystals are cleansed regularly as they will absorb any stagnant energy that is released from The Cards. Once you have left your Reading Space get into the habit of letting go of all the Readings you have done. Do not let them infiltrate your mind or carry them around with you, especially if they have been disturbing. When you first start Reading, you will go over every Reading and kick yourself for things that you think of later that should have been seen when doing the Reading earlier. Cards that made no sense to you during the Reading will suddenly become Crystal Clear to you just as you get into bed that night. You will get so annoyed with yourself you will be half tempted to ring your Client the next day with this new and vital information. You will have a tendency to get mildly depressed or down about Readings you struggled with and this is all quite normal. However, try to get out of this habit as soon as you can or it will drive you to distraction. Unless the Person I am Reading for is one of my Regular Clients, I will not remember what their Reading was the last time they came to me nearly a year ago. When they are Regular Clients, it is my job to remember what their last Reading was like and I have forms to help me with this. 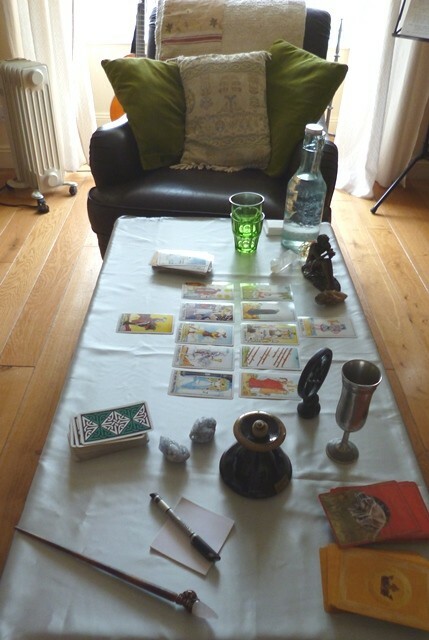 On these Forms I keep a record of their Readings, Spreads used, Questions asked, which Cards are drawn and whether the Readings are becoming more positive or negative as time goes on. I also note the mood and attitude of the Client at each Reading. By keeping Forms for Regular Clients, you can monitor their progress. You will see a pattern forming and there will be certain Cards that consistently turn up in their Readings. 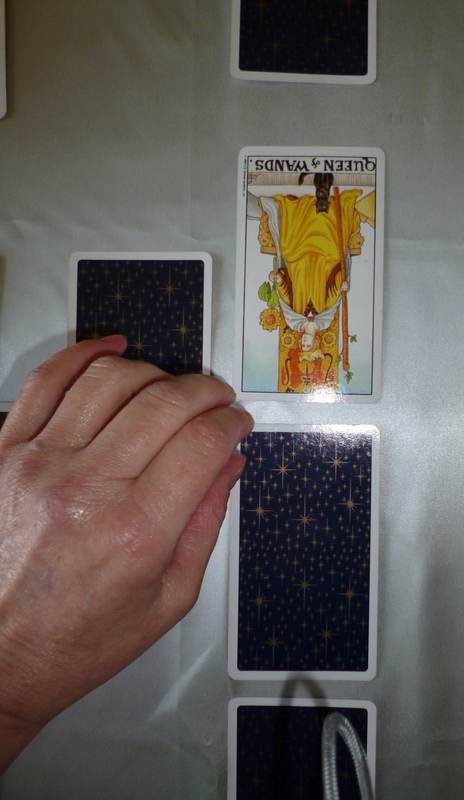 If they are positive Cards then this is fine, but if negative, work must be done in Readings to determine how to Upright these Reversed Cards so that the Client’s life can improve. If you have a large enough Diary, there is no harm in writing a few notes beside your Client’s booking. Just note items such as how well the Reading went, how accurate it was and how communicative your Client was. You can also write down what the Reading was related to, but only briefly. 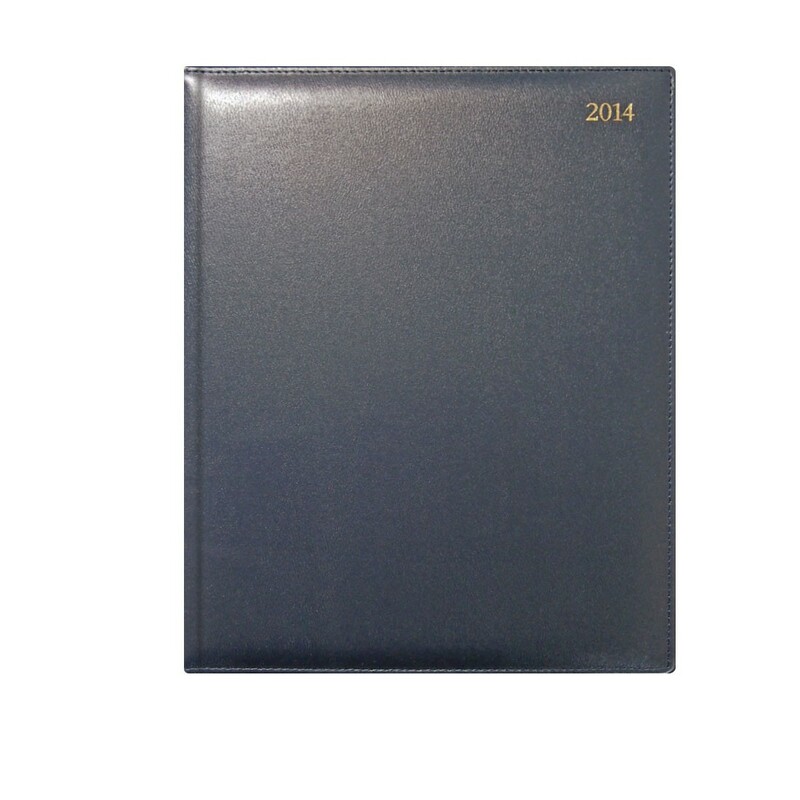 This Diary must be stored where others do not have access to it as you will not want information about your Clients being available to anyone who picks it up. The same applies with my regular Reiki Healing Clients. I have to remember what their Energy Field was like the last time I saw them. With Clients who come for Readings with gaps of several months between Readings, they often expect me to remember their Cards and what I told them. That is impossible to do when you are doing so many Readings. In fact there are times when I forget everything about a Reading within a very short space of time. What this means is that the Reading and all its information is for the Client. It does not belong to me; neither will it belong to you. On occasions you will close the door on a Client and wonder where on earth all that information you just relayed came from? You will know that not all of it came from the Cards and you will have found that you had been talking most of the time without even looking at the Cards. You will also find that nearly everything you said was almost 100% accurate. This will leave you feeling on a high and very excited. What has happened is that for some reason or other, you have opened up and connected on a strong Psychic Level, where the information coming through is not just Card related. Somewhere along the way, your Energy Field has reached out and Dowsed the Energy Field of your Client or Vice Versa. Sometimes it is a mutual agreement and meeting of Energy Fields. The more Readings you do, the more this will happen, but also some Client’s Energy Fields are more compatible with yours and therefore will communicate more readily. The Client’s Energy Field is happy to give up or transfer information to you that would otherwise may remain hidden. This is what Dowsing is all about and I will be showing you how to Dowse in Part III of this Course. Never Read when under the influence of drugs or alcohol. As well as it being highly unprofessional, it is also dangerous. Not just from the point of drugs and alcohol being obviously dangerous, but also Spiritually and Psychically Dangerous. Your Psychic Protection will be worthless if you try to Read while drugged or drunk. It can be very tempting to Read when out at a party with friends when you announce that you are a Tarot Reader and have your Cards in your bag. Resist their pleas and explain that you do not do Readings with drink consumed. Arrange another night. This will earn you more respect in the long run. 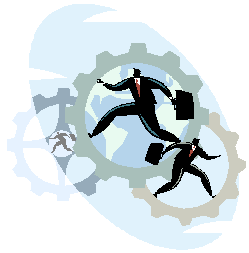 You will also come across as being Professional and serious about your work. If you find that some Friends, Family or Clients are getting too dependent on the Tarot Cards, or contacting you every few days for a Reading then you must firmly put an end to this. Dependency is not a good thing, as people need to find their own way through life at times, under their own guidance. This is something that will definitely happen to you if you decide to Read for The Public. Make it clear that you do not do Readings without an Appointment and stick to this. Otherwise you will be getting phone calls in the middle of the night from Clients or Friends who need you to pull a couple of Cards for them there and then just because they have some urgent decision to make. I once got a phone call at 2am in the morning from a Client asking me to pull a few Cards for her because she was booking a holiday online and had a choice of Spain or Italy to go to for the same price. She wanted to know which would be the best destination for her. Which would offer the best enjoyment and value for money? I do have Clients who come to me regularly but certainly not every week. As a Tarot Consultant, I have Clients who come to me to see how well they are progressing with their issues or goals. They generally check in with me once every 4/6 weeks. They need those weeks to put any advice or findings into action to determine whether they are working or not and whether they can keep them up. They need to stand on their own two feet during that time. 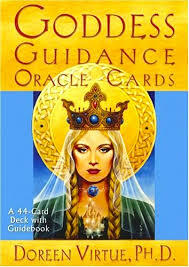 Then they come back for a Maintenance Style Reading and also if any other issues pop up in their life in the meantime. These Clients I view as very different from the Tarot Addicts who spend most of their time going from Card Reader to Card Reader and also Psychics and Mediums. My Clients are working towards Personal Goals and use the Tarot to help guide them to their Goals. Once they have achieved their Goals, they may not book an appointment with me for some months afterwards. As a Tarot Reader, you will be seen as Special to many around you, even people who do not know you. 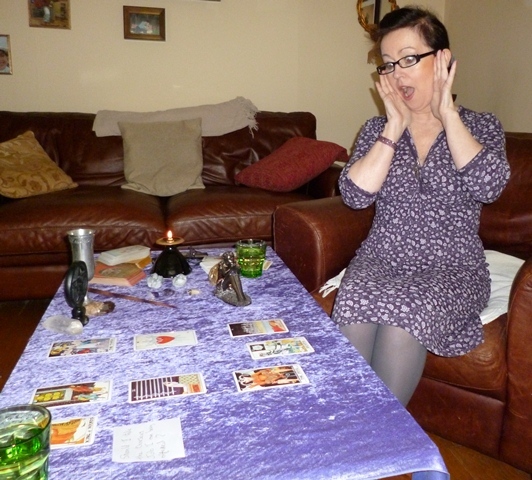 It is not uncommon for Tarot fanatics to try to befriend you by inviting you everywhere. These are easily weeded out as they will ask you to make sure you bring your Cards to all occasions. I had a Tarot Student who was also studying to be a Medium. 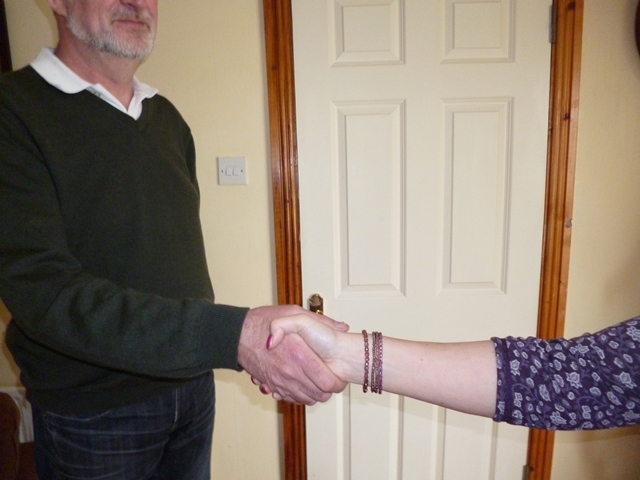 She then attended an Angel Healing Workshop where personal introductions were encouraged by the facilitator. Each attendee had to introduce themselves and tell the group what they did, why they were there and what they hoped to get out of the Workshop. At lunch on the first day of the Workshop, she was approached by a man who asked to sit beside her. She had no problem as they were all seated at the same table. However, he sought her out again at coffee break and yet again the next day. My student told me that the man was very nice and she felt flattered by his attention. On the final day of The Workshop, he asked for her phone number and if it was okay to text her? By this stage, my student was thinking of a blossoming romance and was quite excited. The man texted her that night and asked to meet for coffee the next day. He also asked if she would bring her Tarot Cards with her. Thinking nothing of it she agreed as she now had her Rose-Tinted Glasses on. When she turned up for coffee, they chatted for a few minutes before he asked if she would do a Reading for him. She agreed once more and the man was delighted. He then asked her if she was picking up on any spirit energy around him. She explained that she needed a private place to do Medium Readings and a coffee shop full of people coming and going would be too distracting and confusing. He rushed her out the door and they sat in his car. My student felt under pressure and said that it was too rushed. The man seemed disappointed and slightly annoyed. He continued to text her and ask her for coffee. He also continued to ask her to bring her Cards. He then would take her walking to a local park where they would sit on a bench and he would persist in asking her to do a Medium Reading. It took some weeks for my student to realise that the man had absolutely no interest in her as a person or romantic partner. He was just after her for gifts and psychic abilities. Once she told him she would not be bringing her Cards anymore and could they not just go out to dinner or the movies, she never heard from him again. 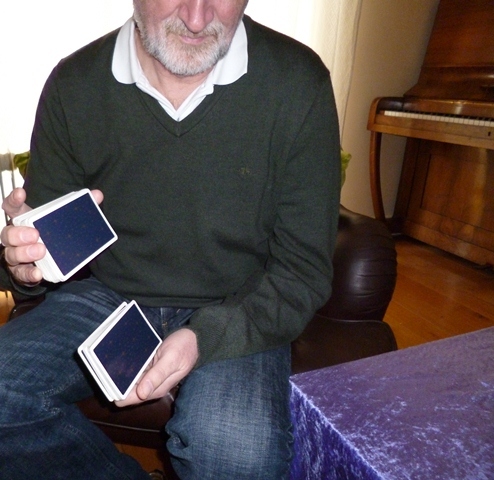 The moral of this story is Do Not Let Yourself Be Used By Tarot Junkies. Keep a Professional Distance at All Times. Last but not least, learning the Tarot takes time and commitment. Practice is key, and if you can find a friend to act as guinea pig, or arrange twinning with a course member that is great. However, if you are practicing with the same person all the time, eventually you will get to know all the answers to their questions as you will have seen and heard it all before, over and over again. For confidence building this is fine but fresh blood will really get you working and improve your interpretation and storytelling skills. You have to remember that we are all human beings and because of that the same story-lines will appear time and time again. The Cards will not always come out the same, but most people’s issues are archetypal and therefore once you can find the loose thread in The Reading, it will begin to unravel and you will soon understand that most stories Read the same, different characters, different environments but fundamentally we all share the same problems. There will be a Video to accompany this Guide in the near future.